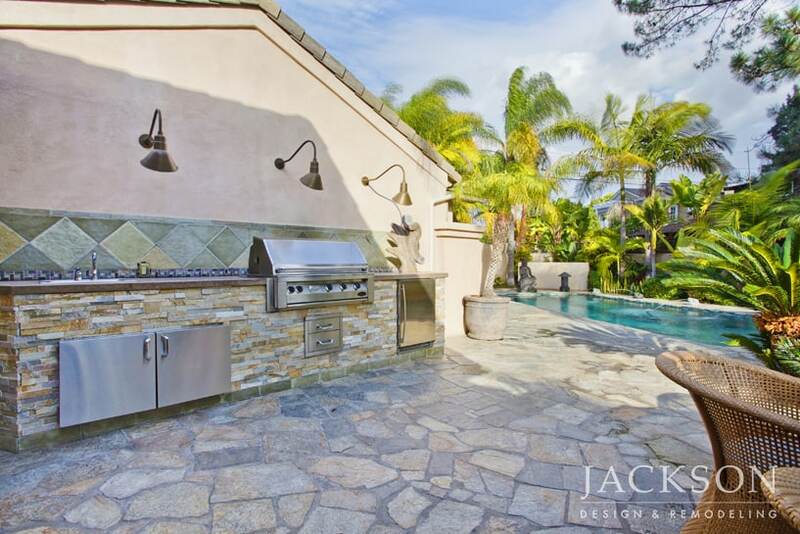 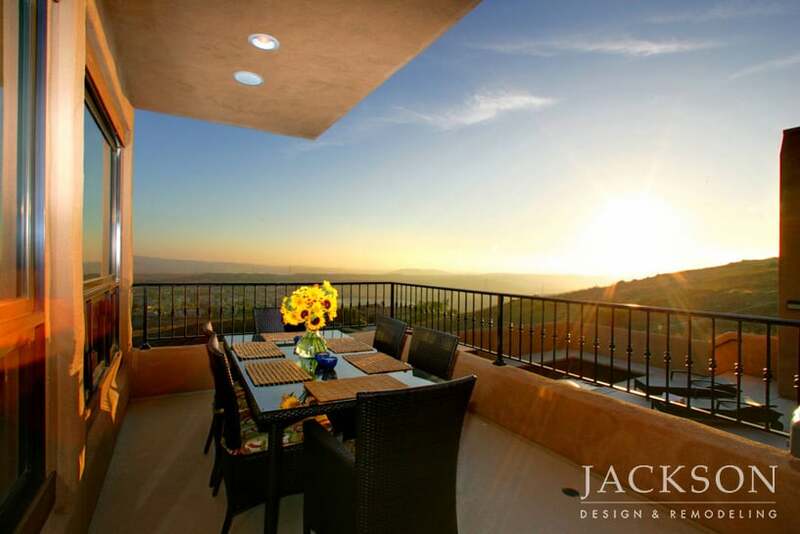 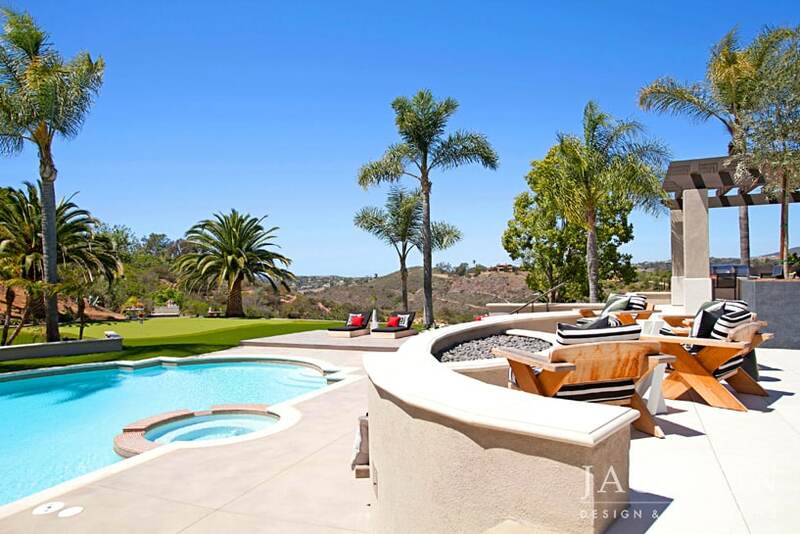 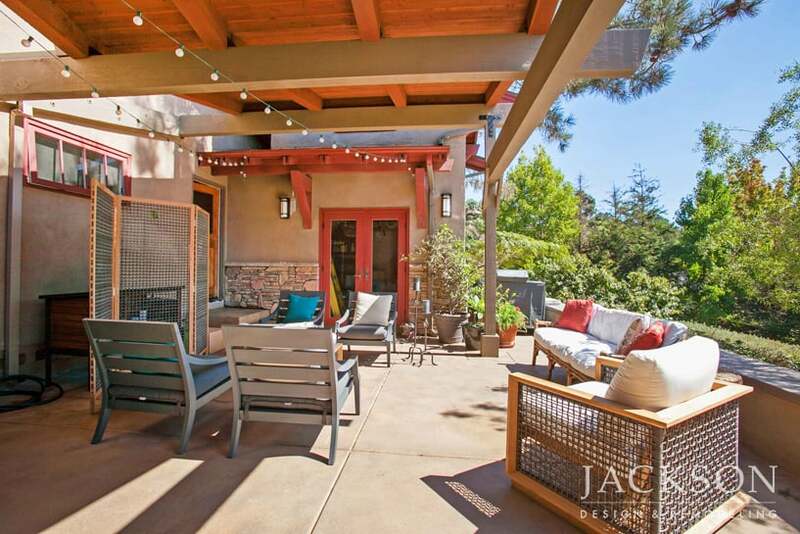 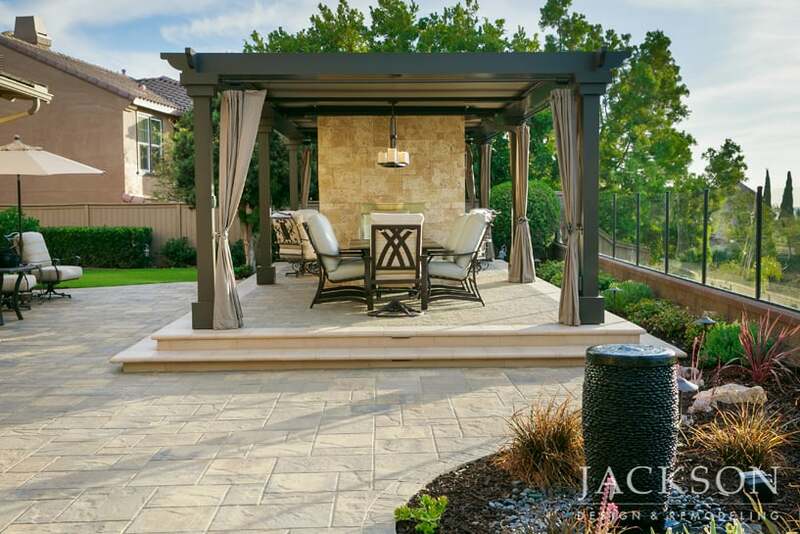 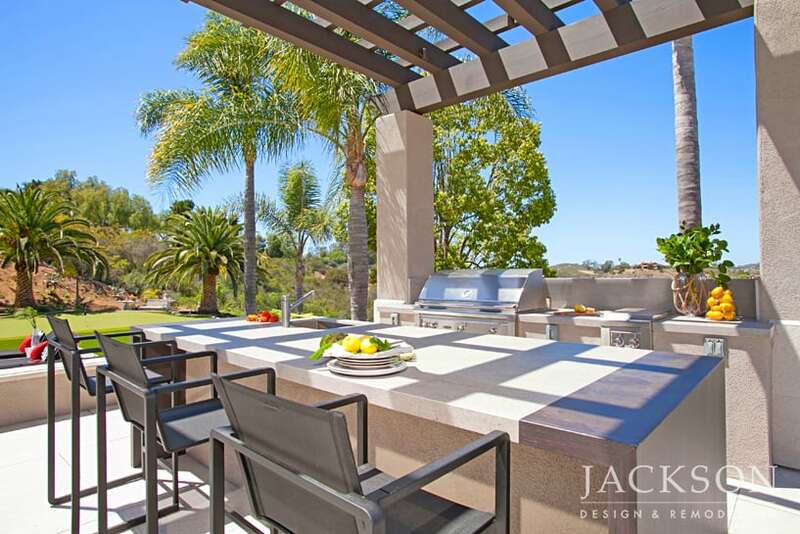 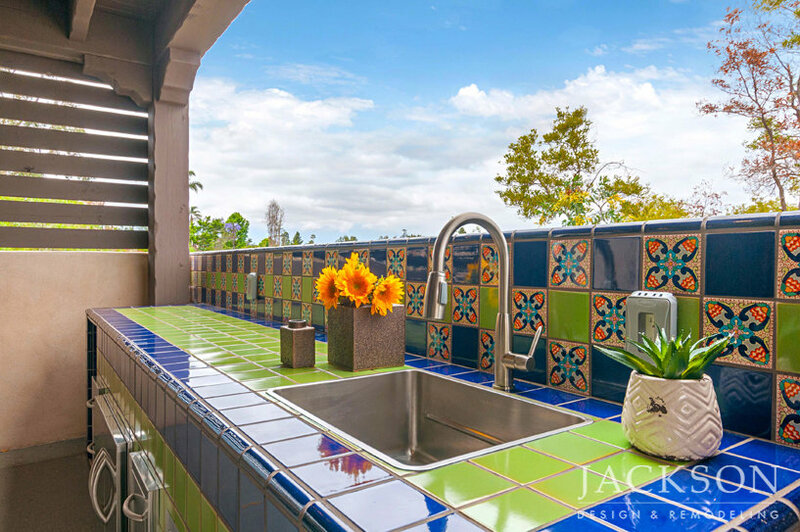 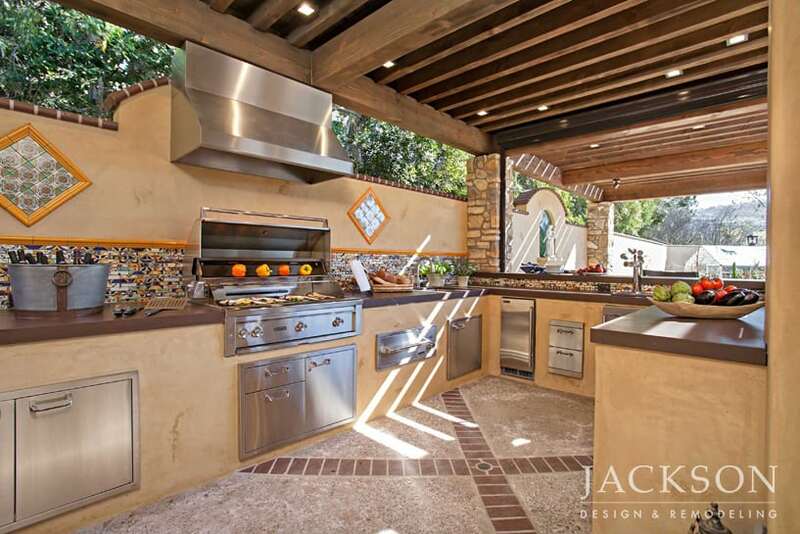 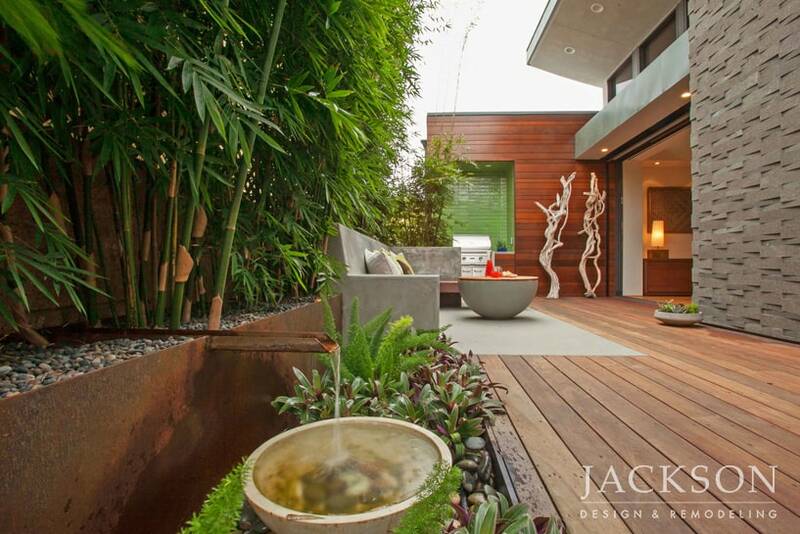 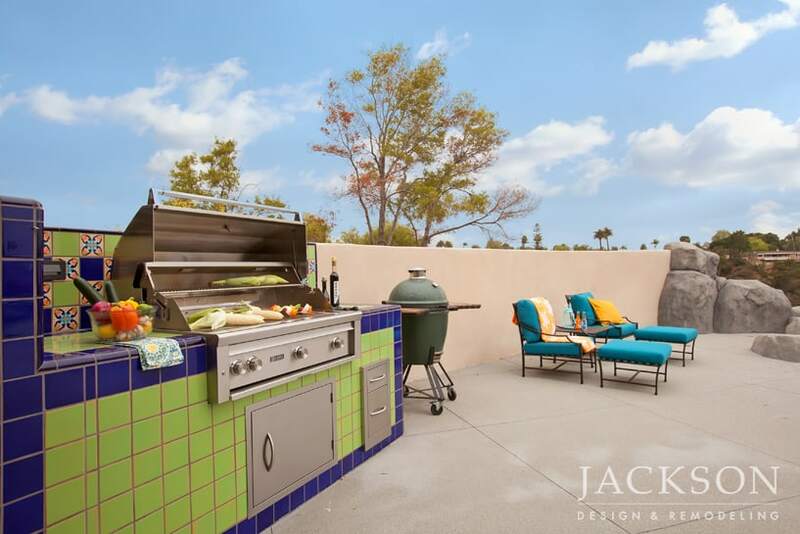 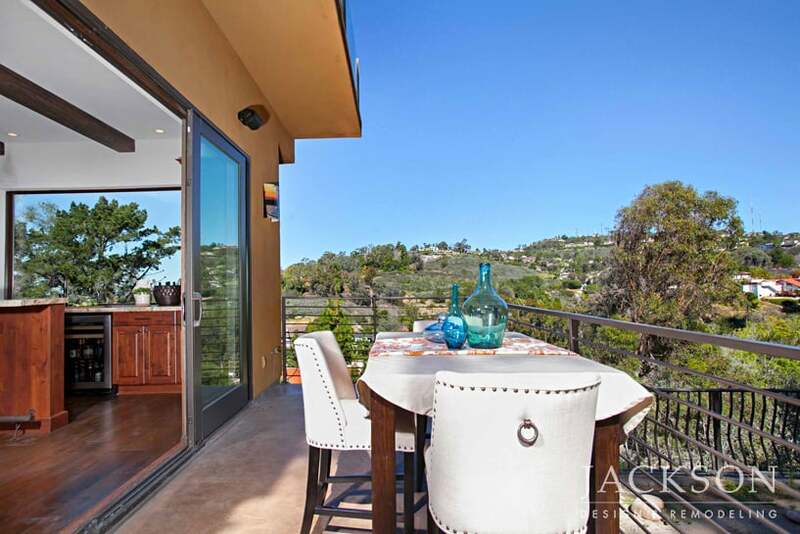 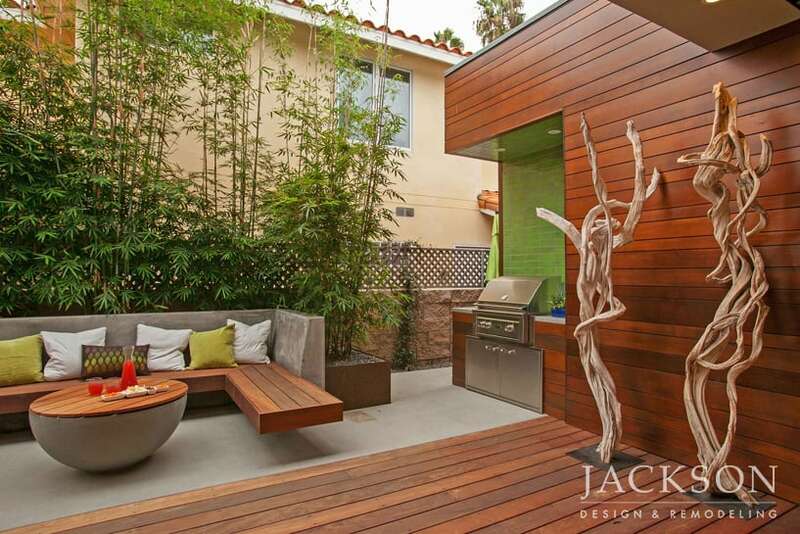 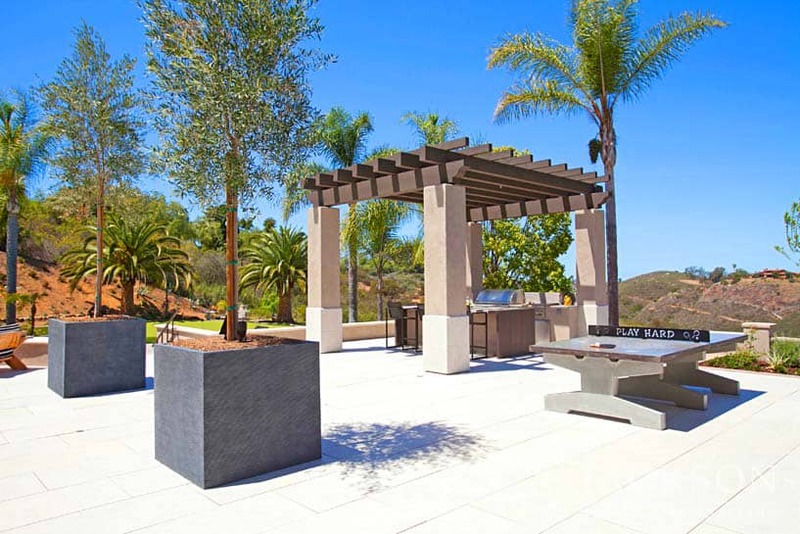 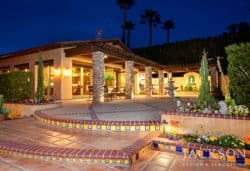 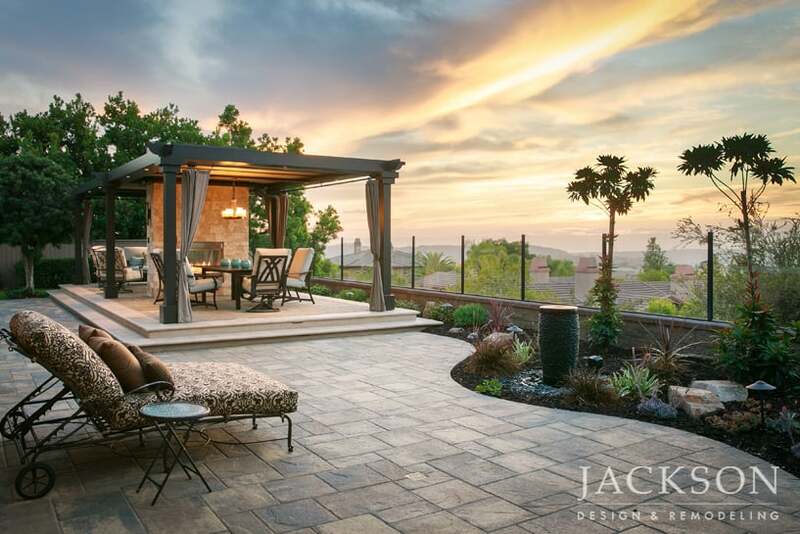 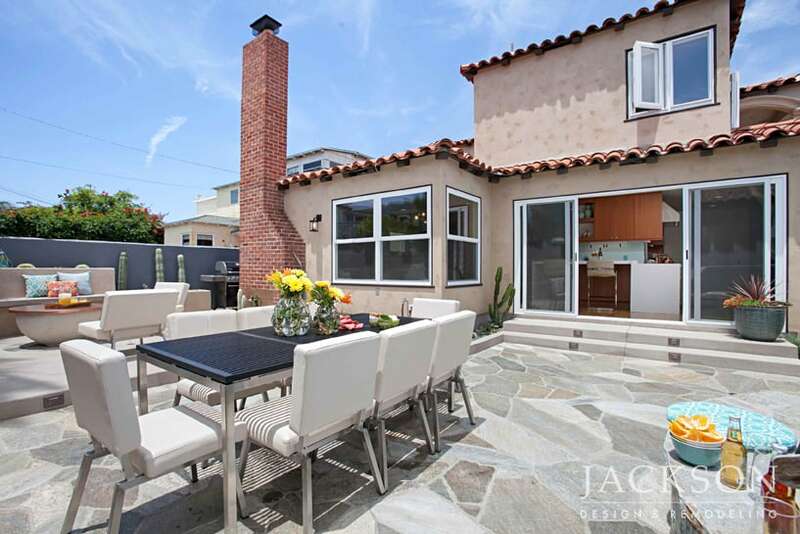 Outdoor living and backyard design in San Diego is often more important to our lifestyles than it is to homeowners in other parts of the country. 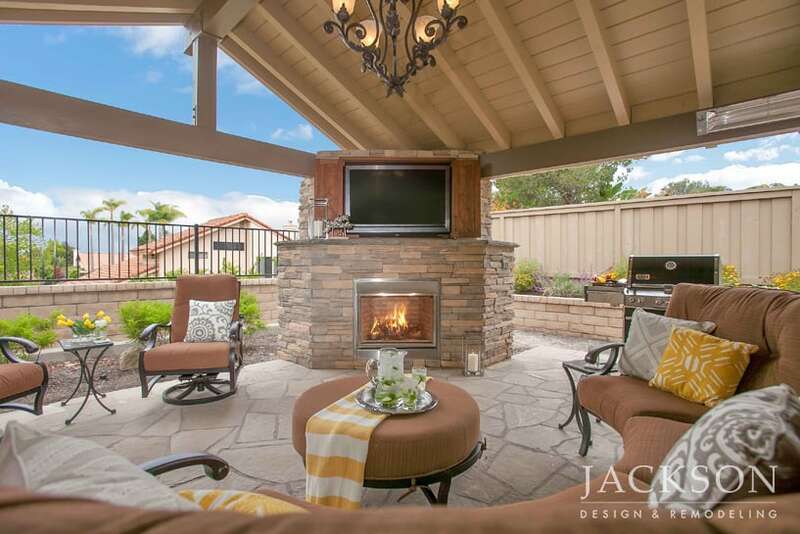 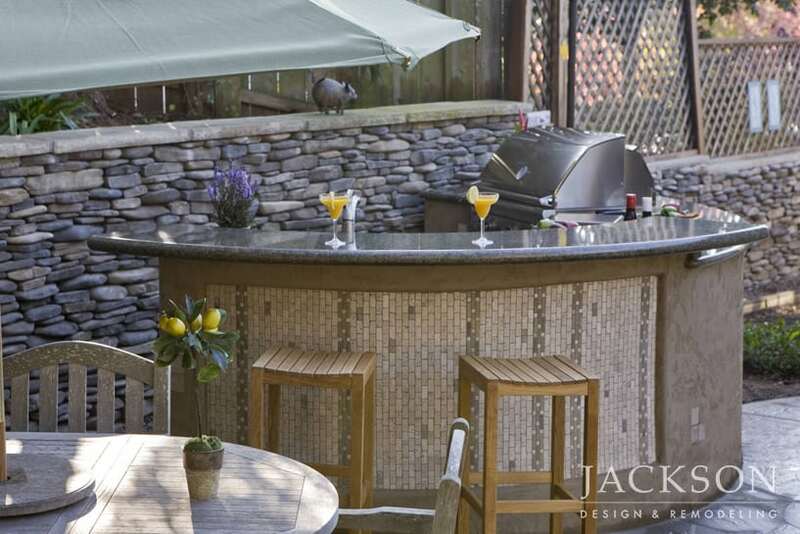 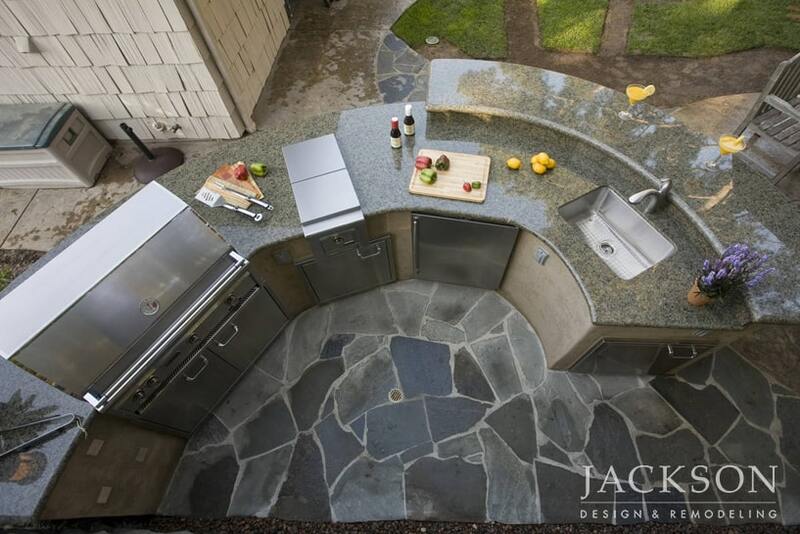 Since we experience mild temperatures throughout the year, elements of backyard design such as beautiful landscaping, outdoor kitchens, bar areas, pools and hot tubs, can be wonderful additions to our homes. 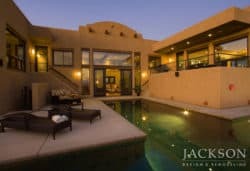 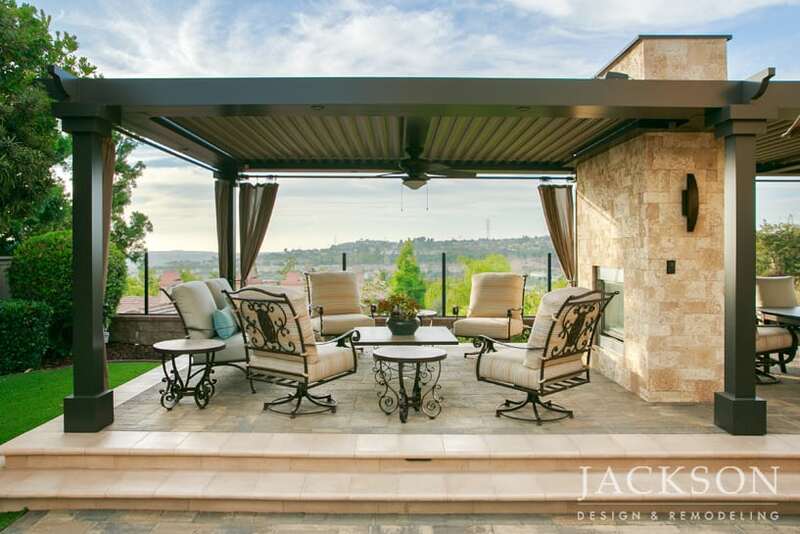 Outdoor living design expands your living space, deepens your connection to nature and provides enriching possibilities for family life and entertaining. 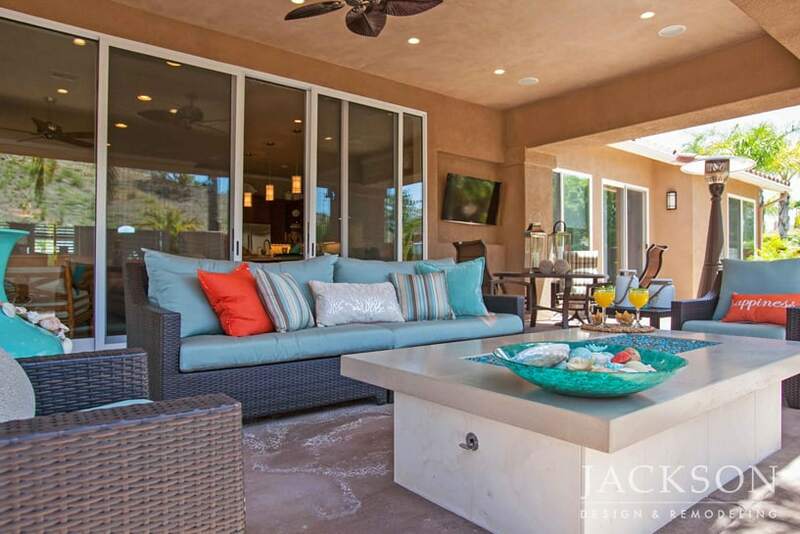 Encompassing a spacious cabana, along with a pool, jacuzzi, outdoor kitchen, fire pit, and several areas for games, relaxing, and lounging, this outdoor living space on over two acres emphasizes chic simplicity in harmony with breathtaking nature. 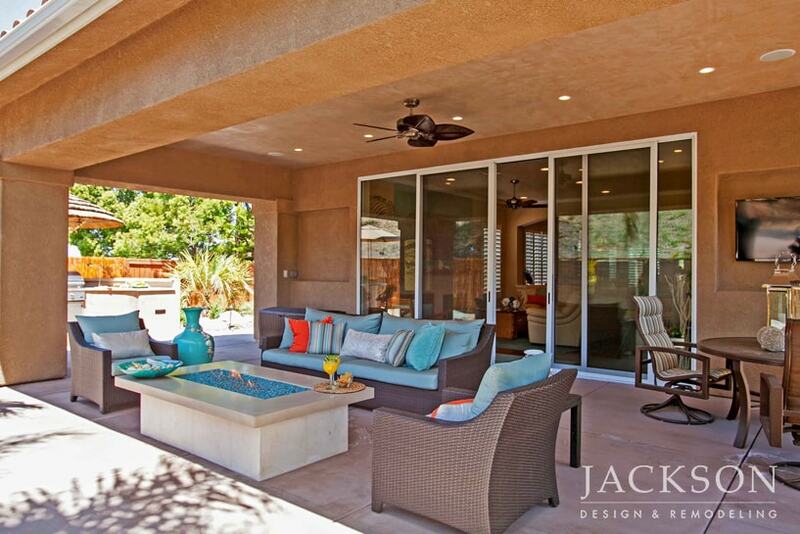 This outdoor living space presents the ultimate experience in indoor/outdoor living. 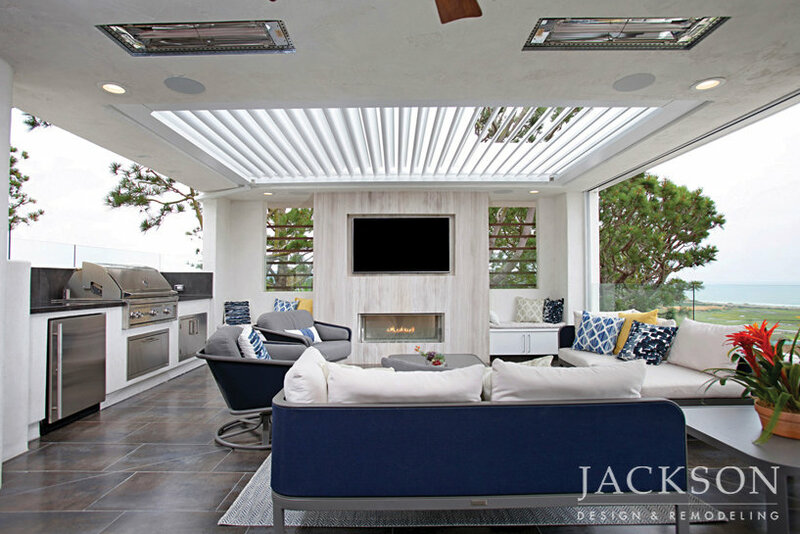 A louvered roof, glass side panels, recessed screens and a fireplace combine for a sense of luxurious comfort in any weather. 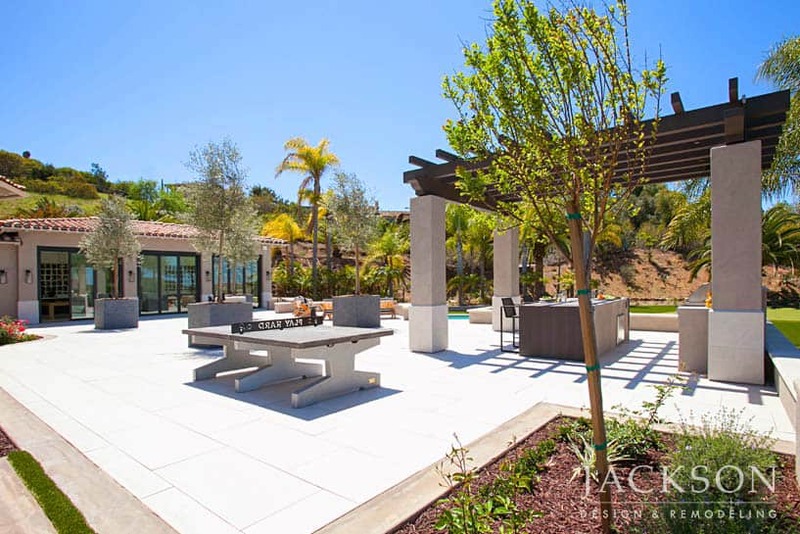 In the expansive outdoor living space of a historical home, the guest house, main home, outdoor kitchen/living area, and pool are unified with distinct gathering spaces. 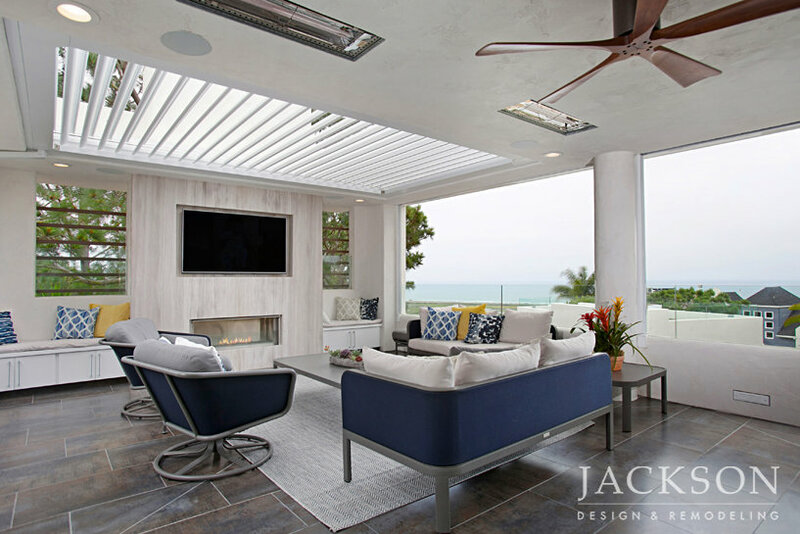 The design balances the history of the home with the energy of a young family to convey the feeling of a comfortable resort. 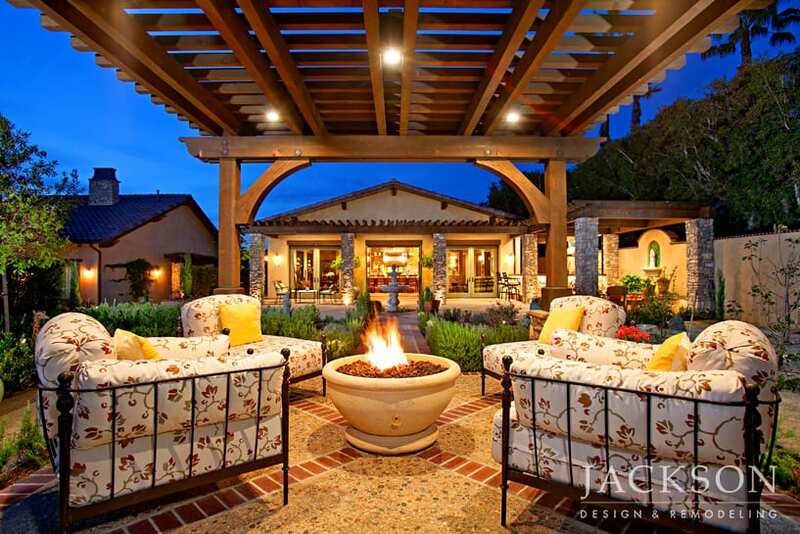 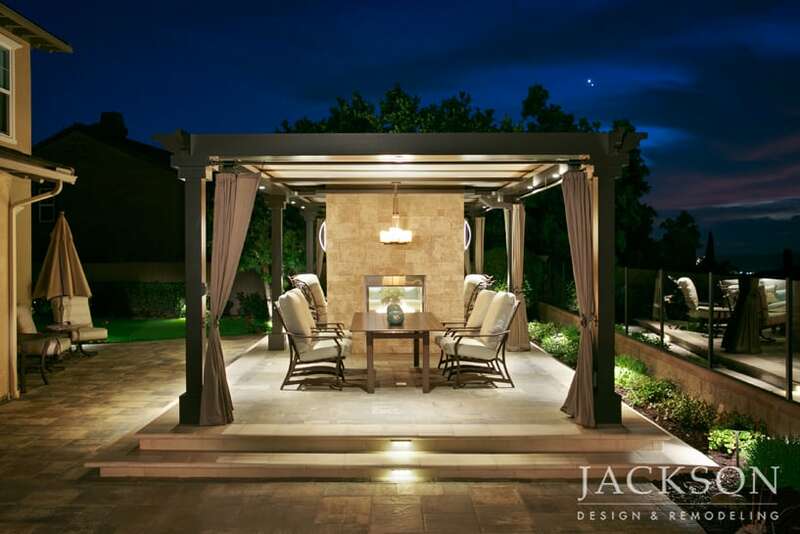 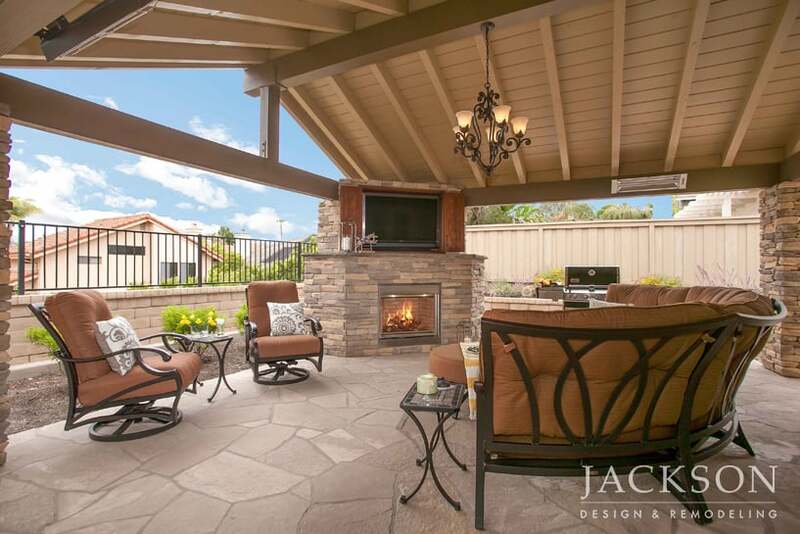 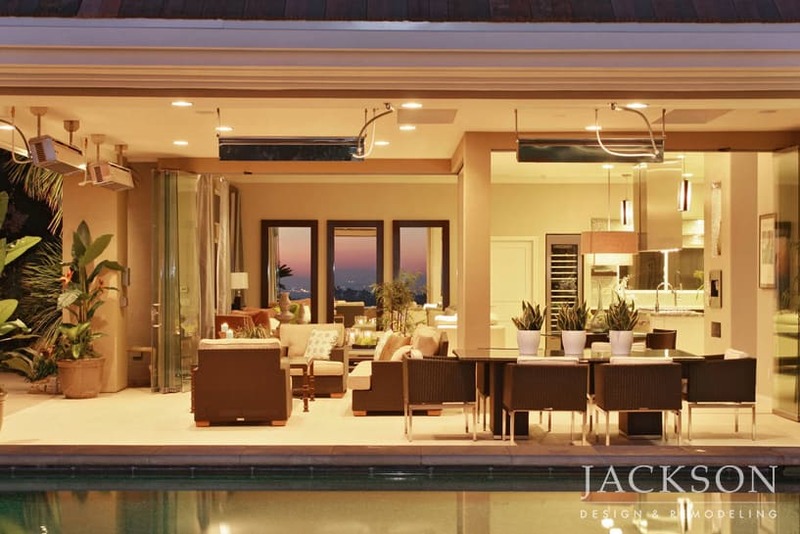 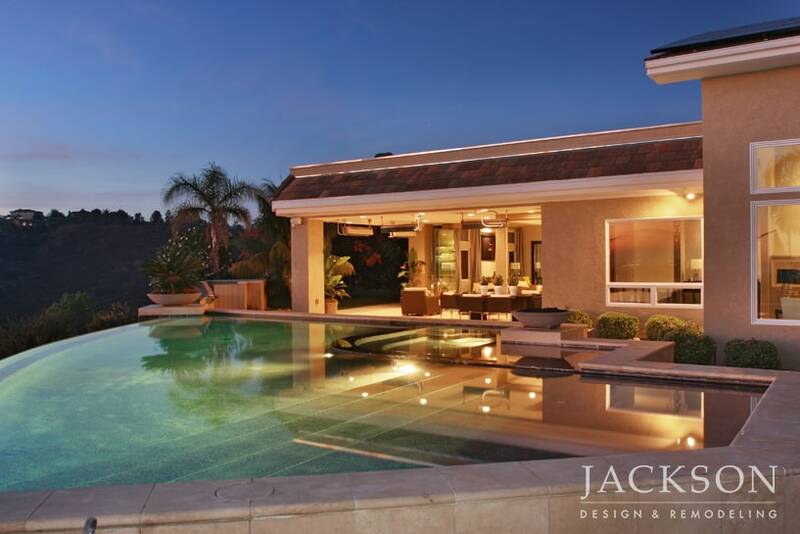 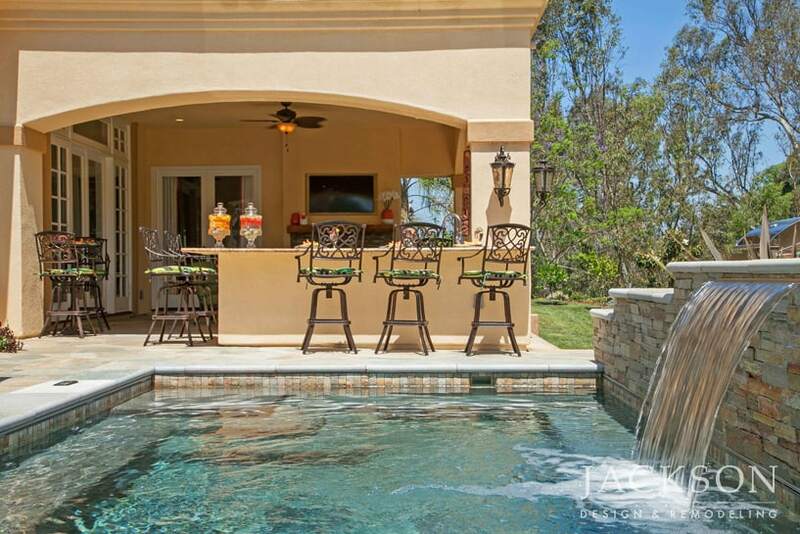 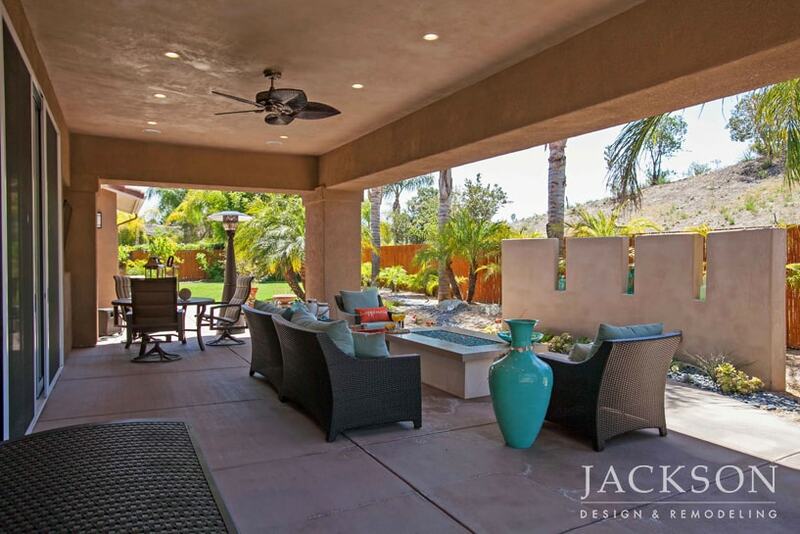 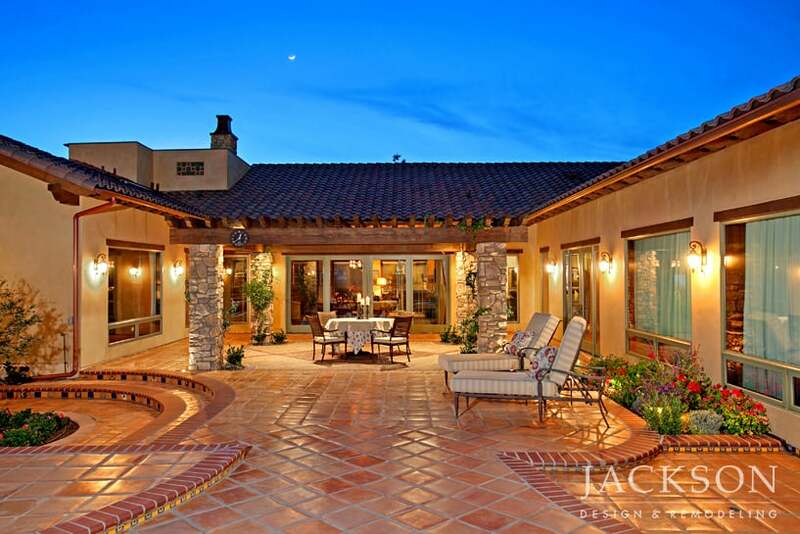 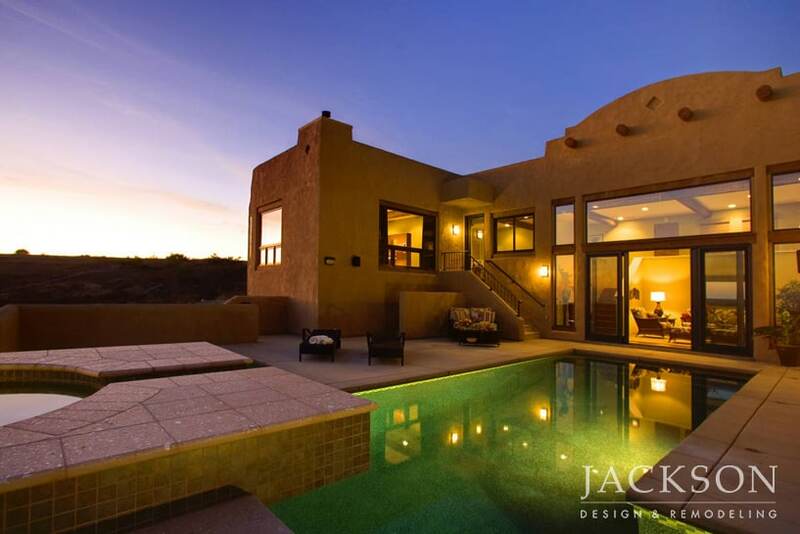 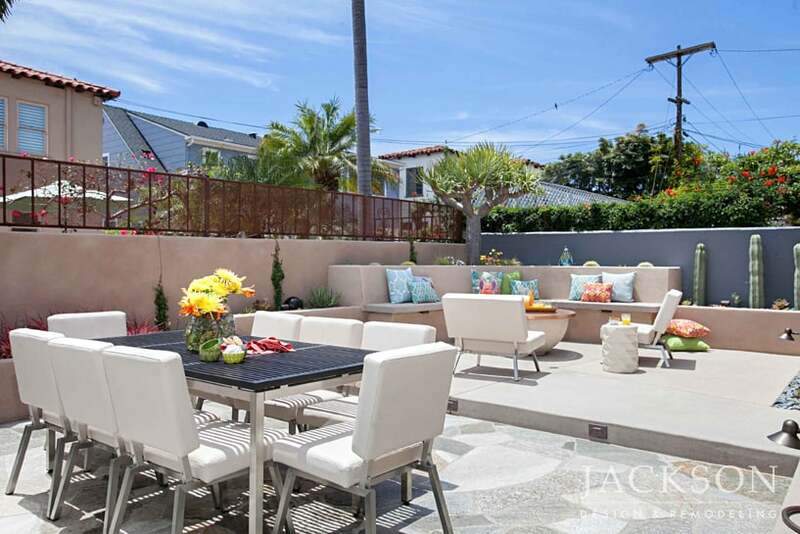 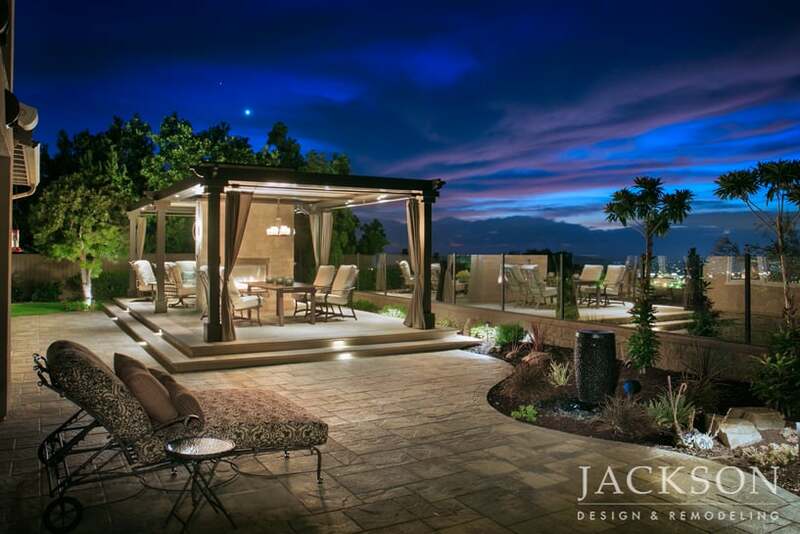 Day or night, this outdoor living space is an ideal setting for relaxing and entertaining. 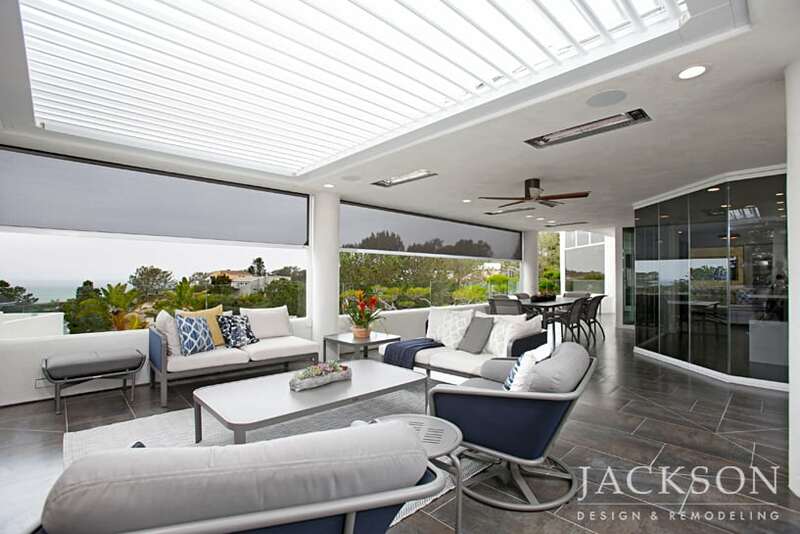 Oriented to sunset views, the space was meticulously planned to meet code requirements in its relationship to the main home. 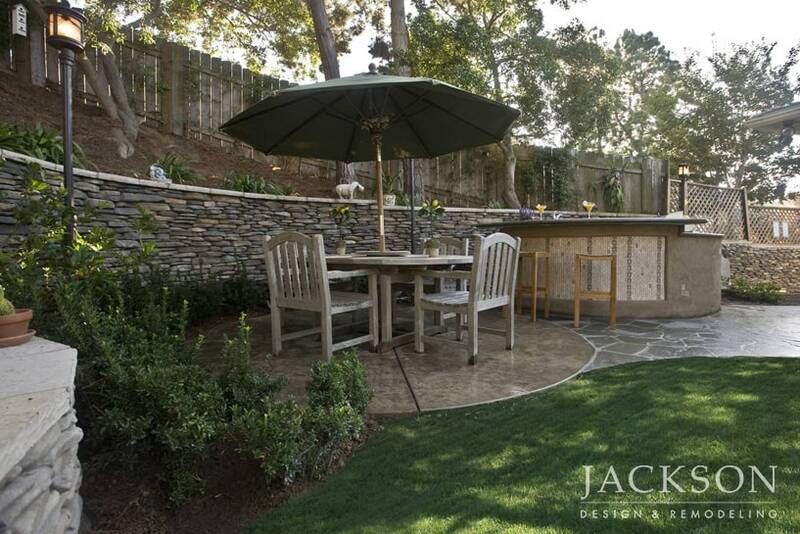 Hardscape materials provide comfort and safety for the homeowners’ beloved dogs. 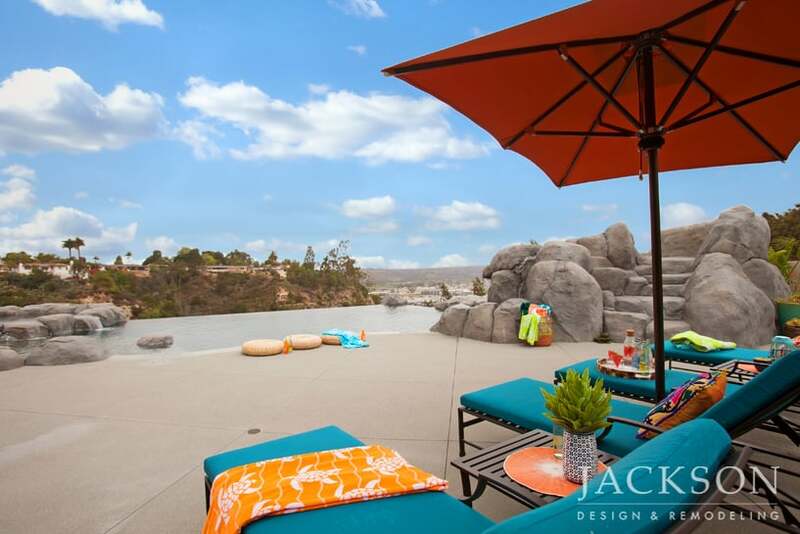 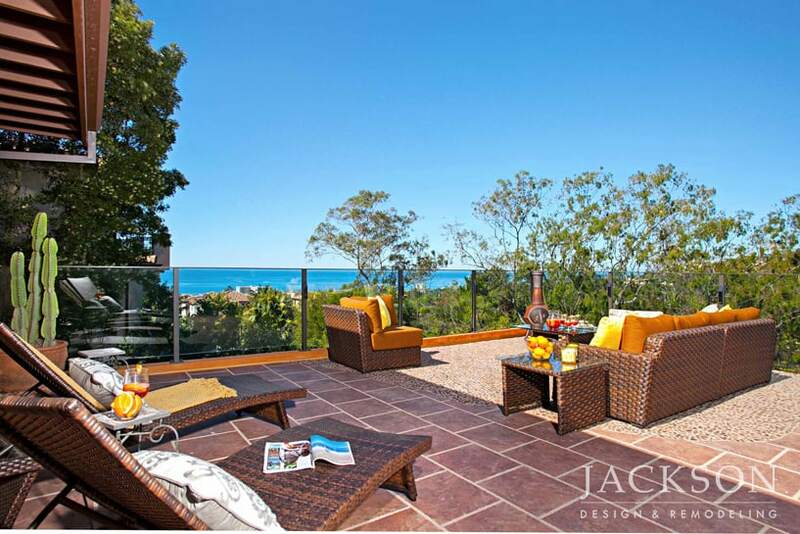 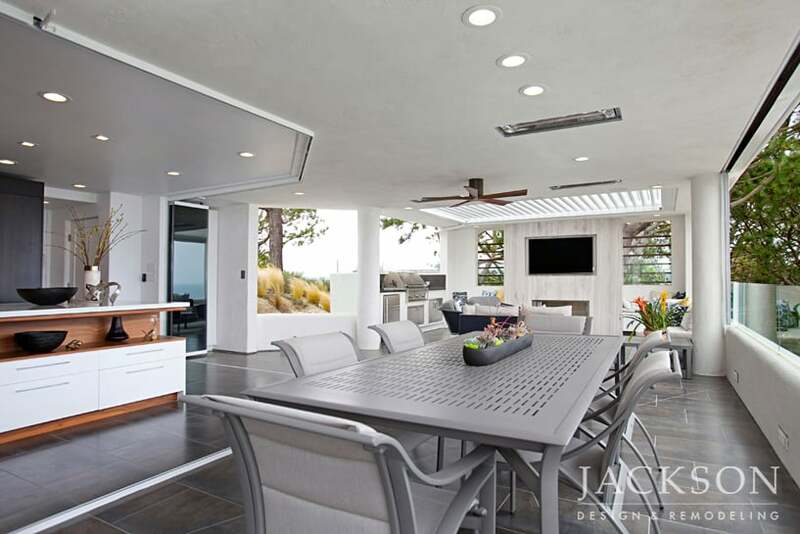 The expansive outdoor area of this custom home built for News8 anchor Larry Himmel and his wife, Joan, invites relaxing with spectacular views. 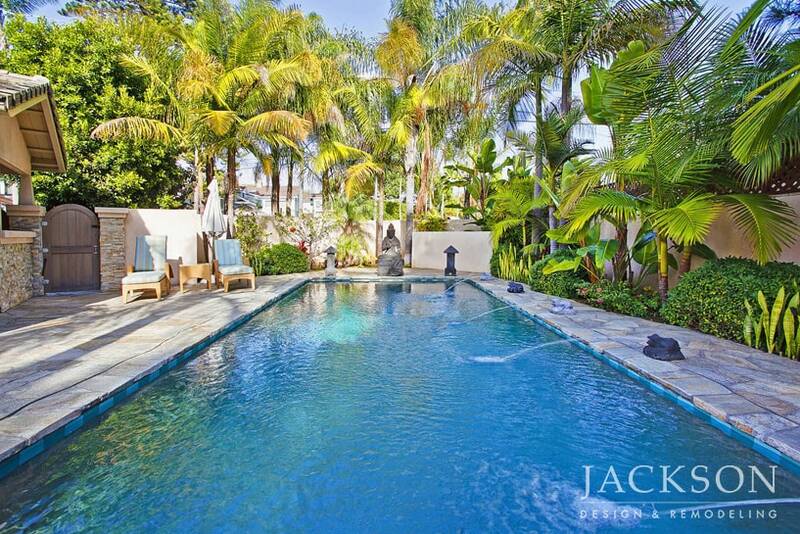 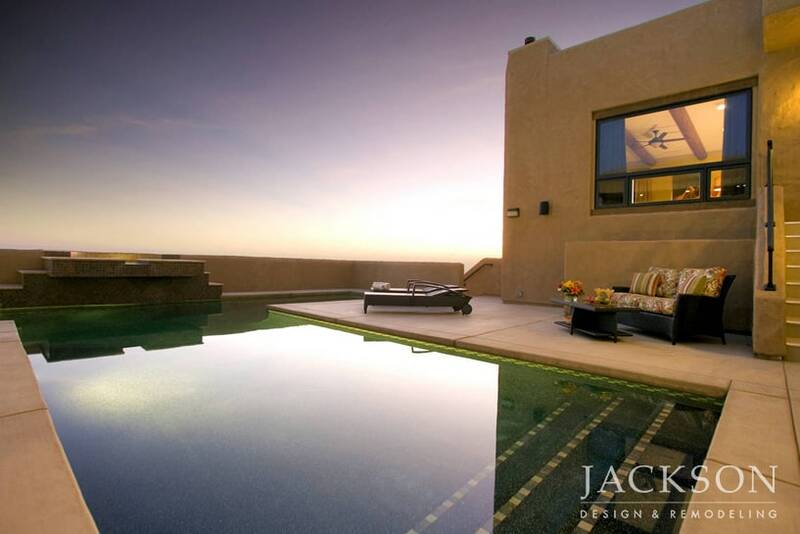 A luxurious pool is a seductive element. 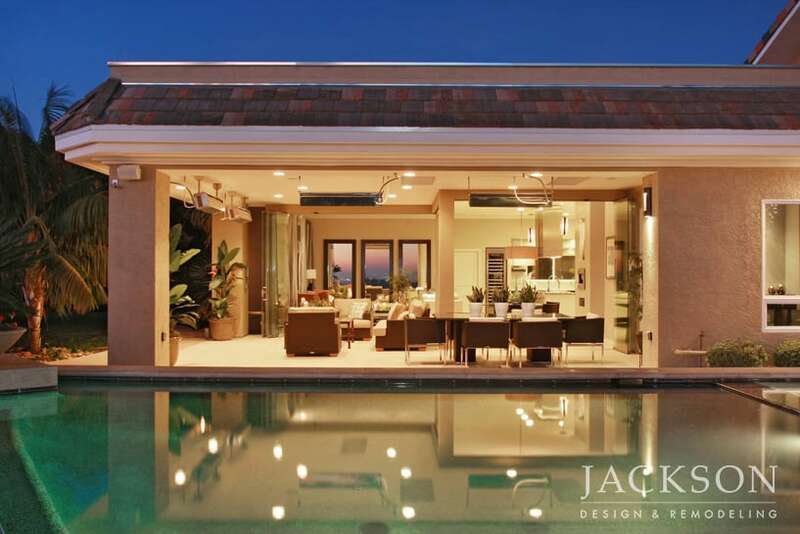 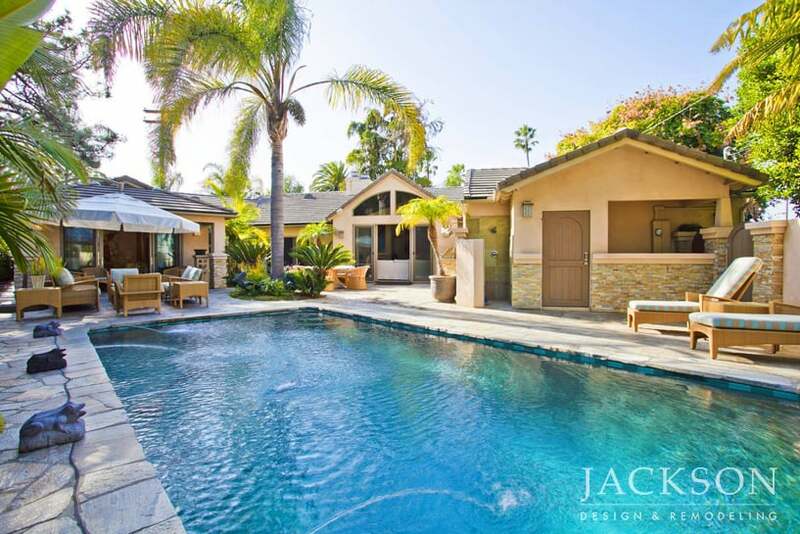 A serene pool is the centerpiece in an extensive outdoor space that includes a guest pool house, an outdoor kitchen and shower, and spacious areas for sunbathing, dining or entertaining. 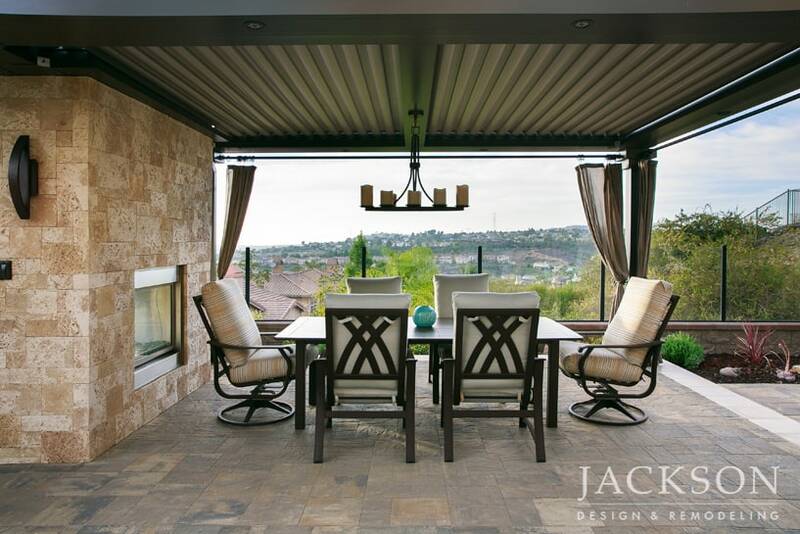 The outdoor area of this award-winning universal design whole home remodel creates a seamless addition to the rest of the home. 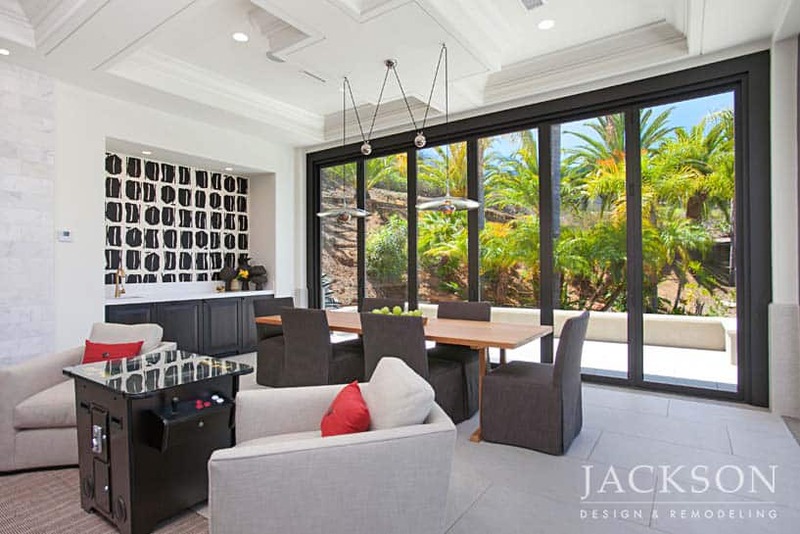 An innovative Finnish bi-fold door system opens the interior to the exterior. 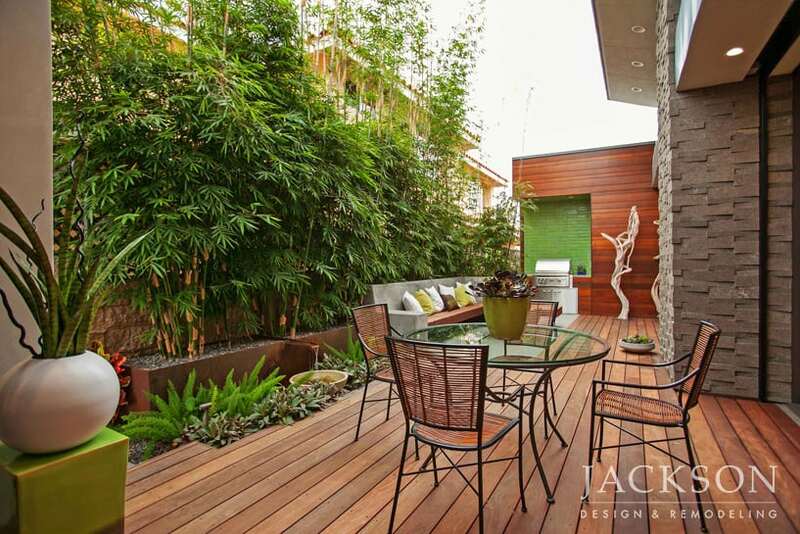 This verdant outdoor space works both as a peaceful oasis for intimate dinners and a stunning natural area for festive gatherings. 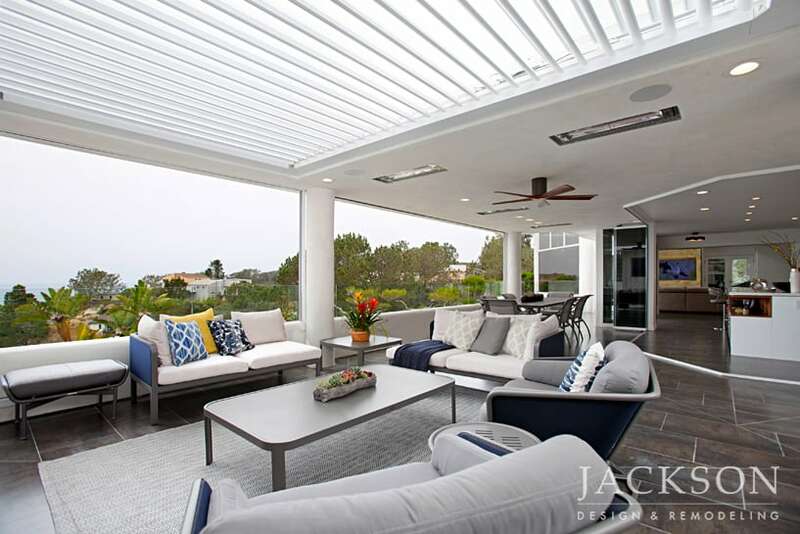 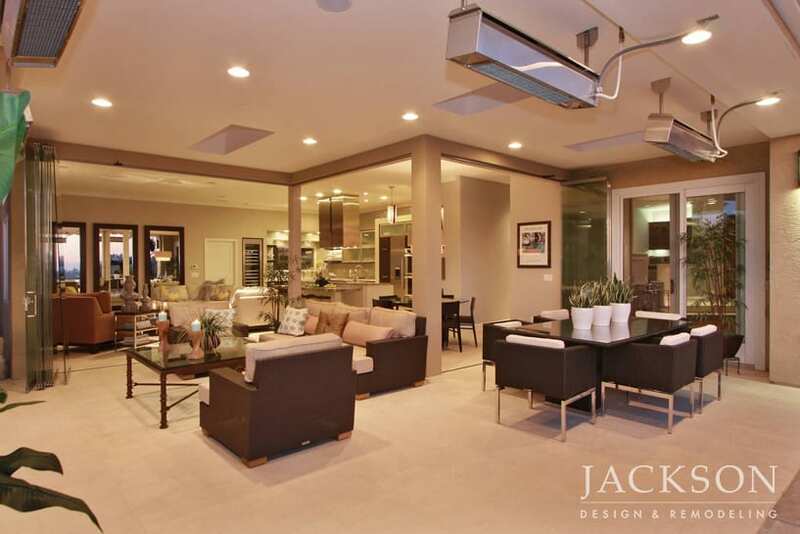 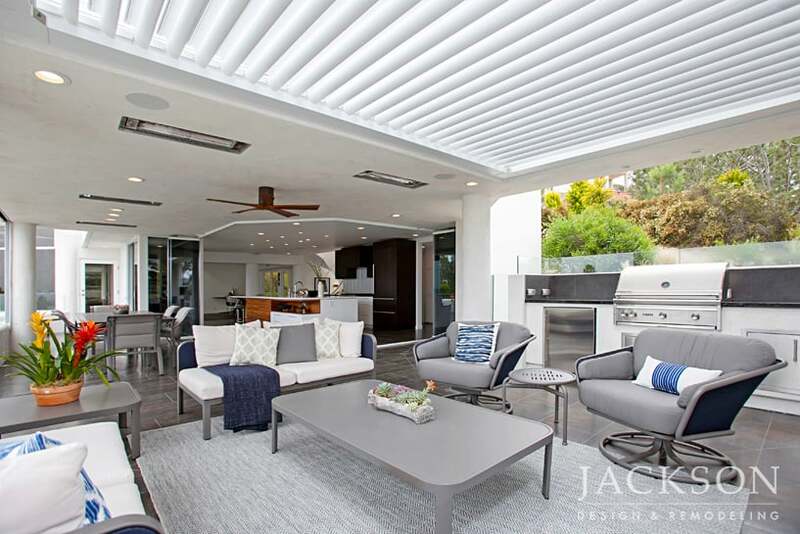 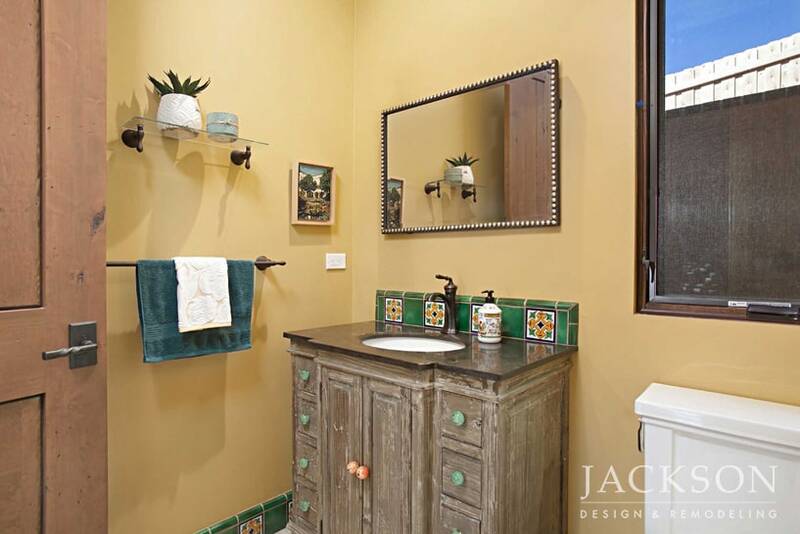 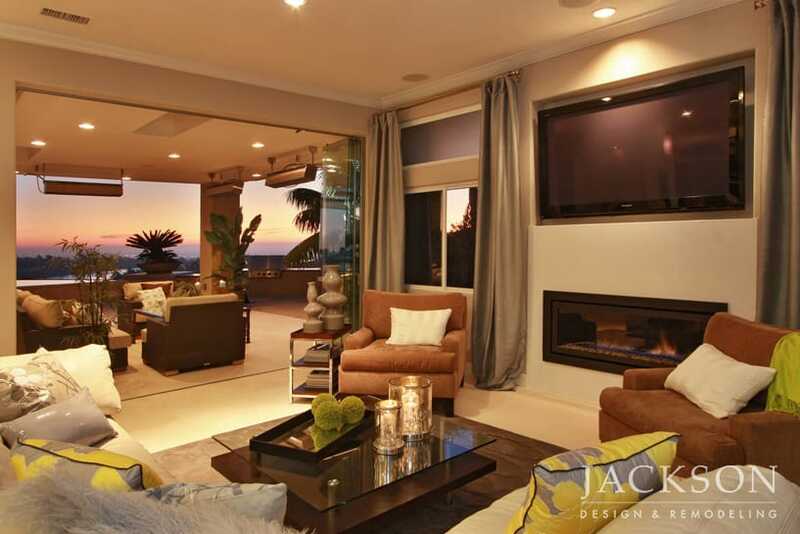 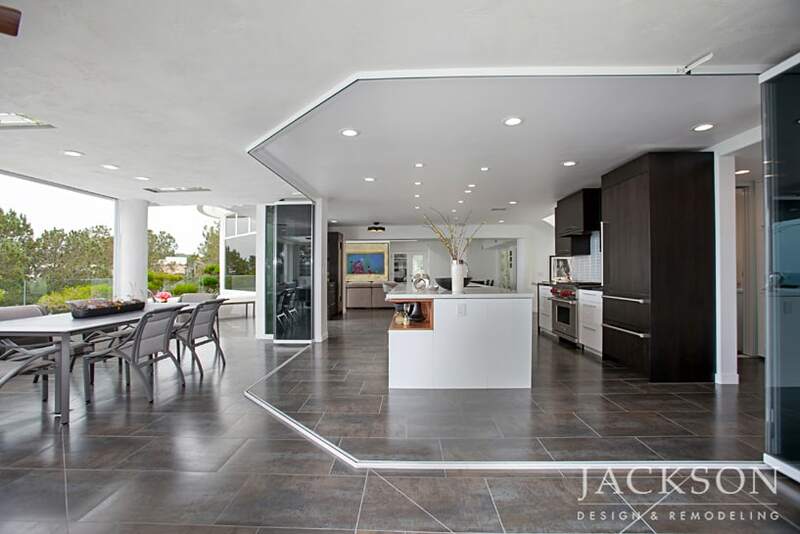 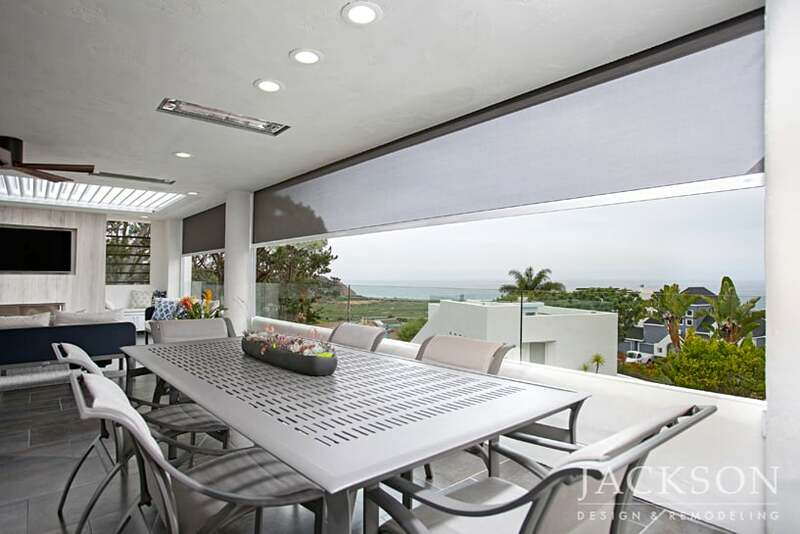 Indoor and outdoor living are seamlessly unified in this La Jolla Shores home. 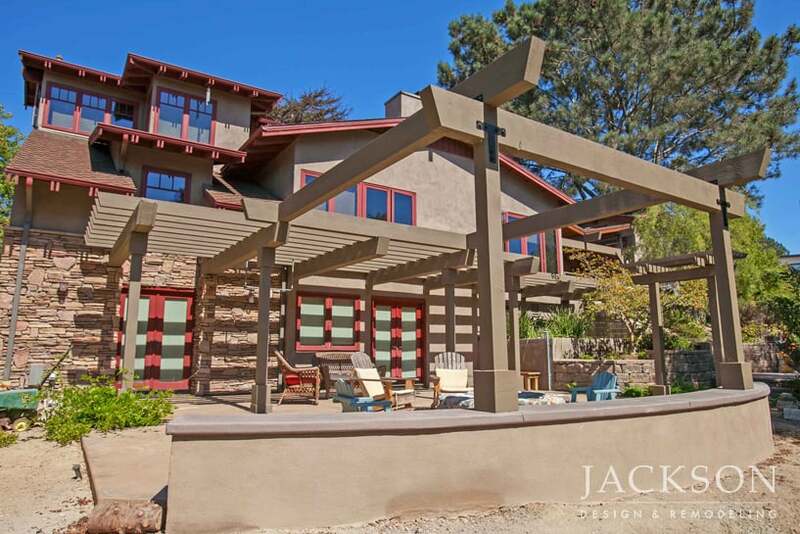 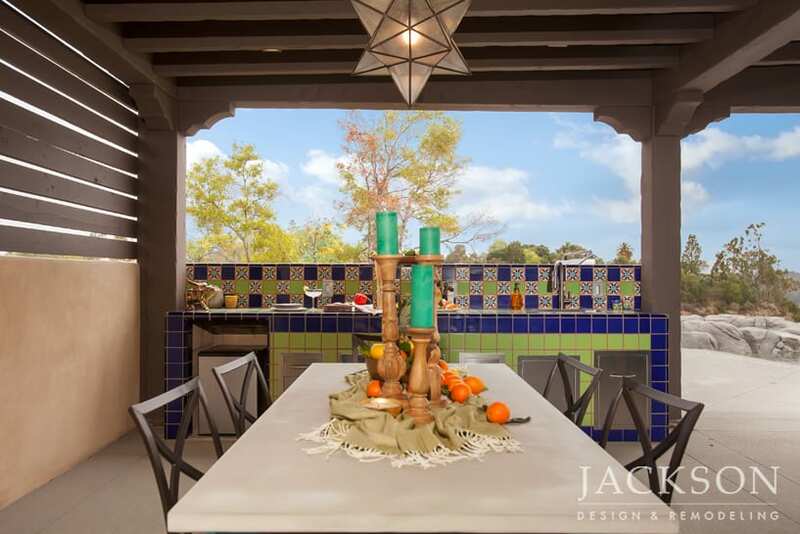 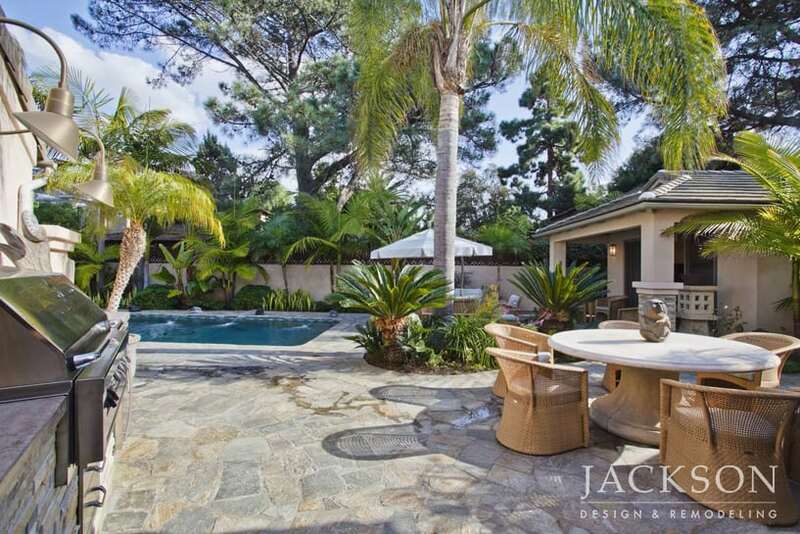 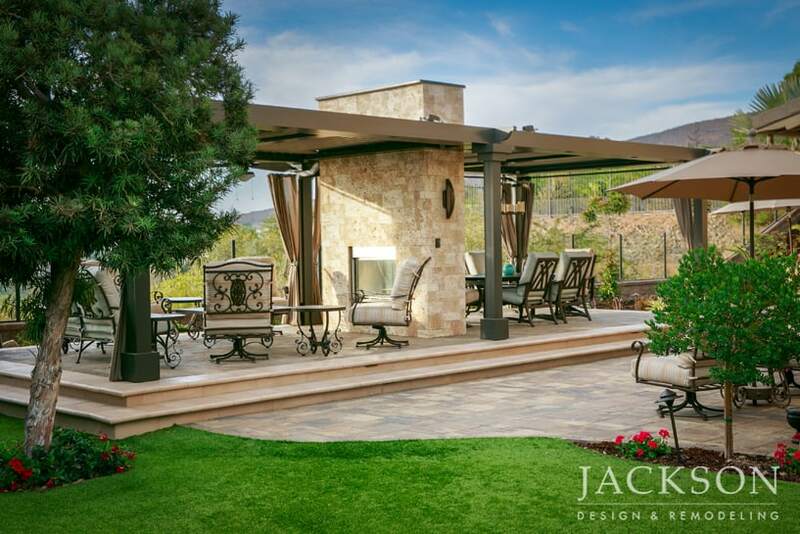 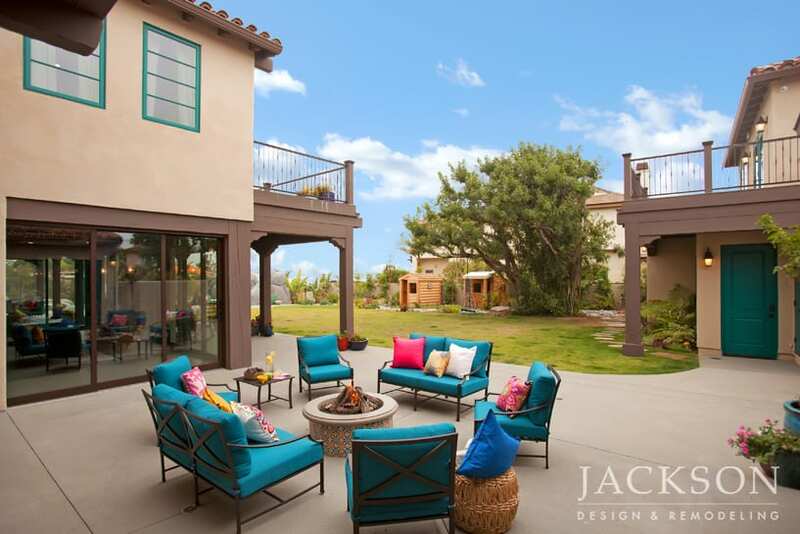 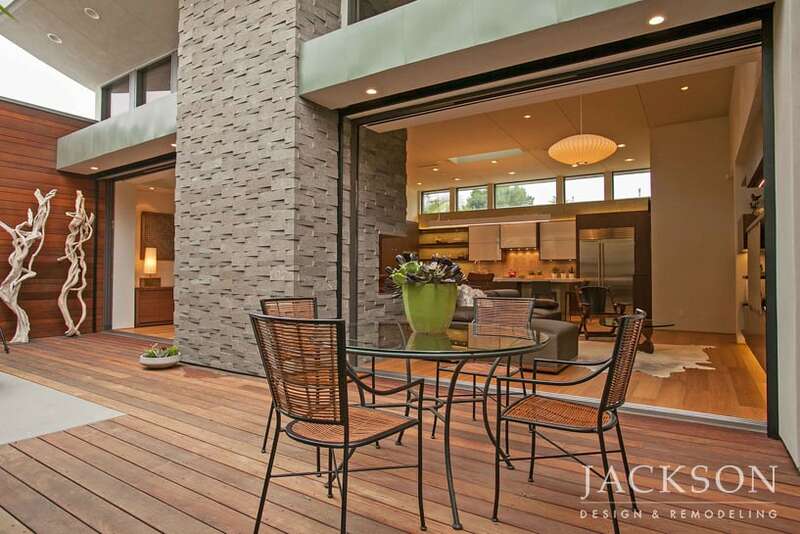 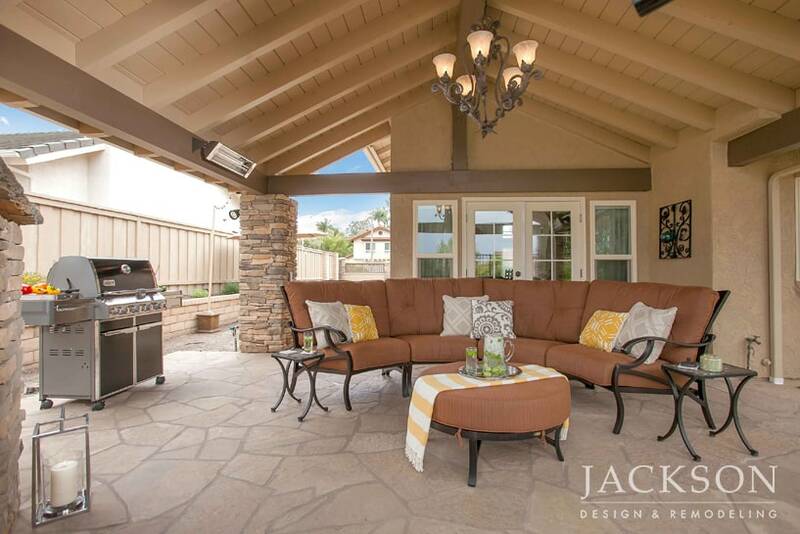 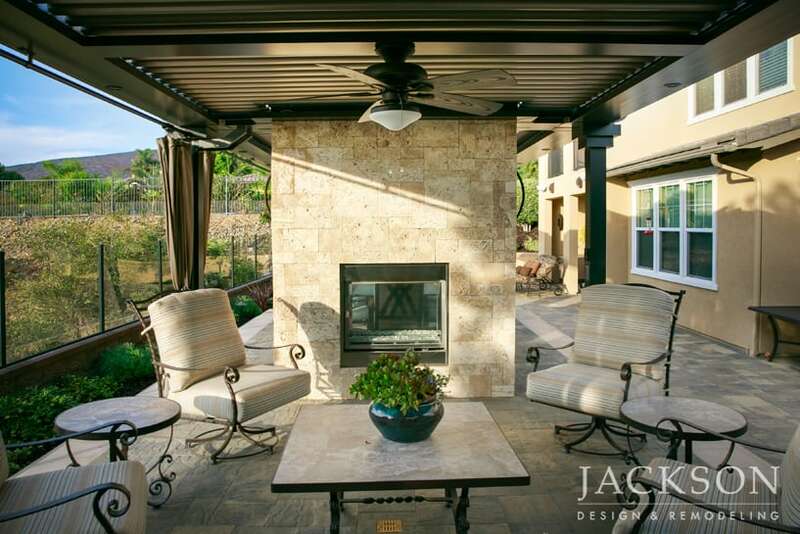 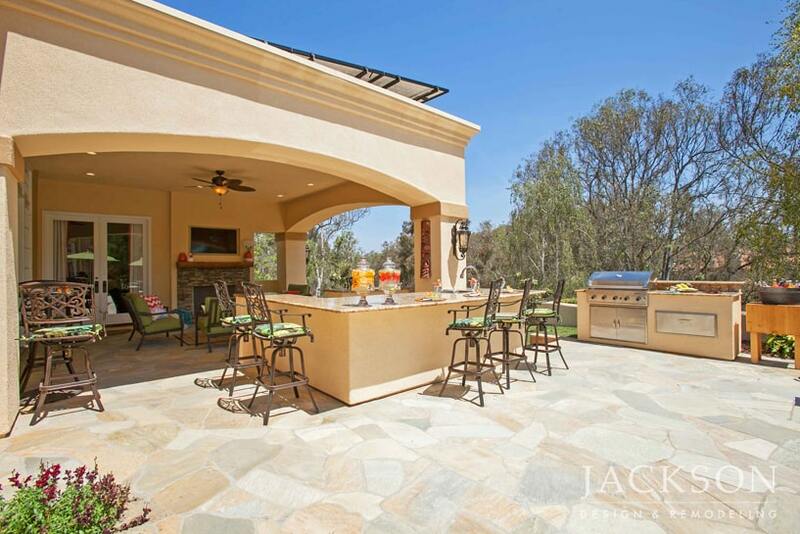 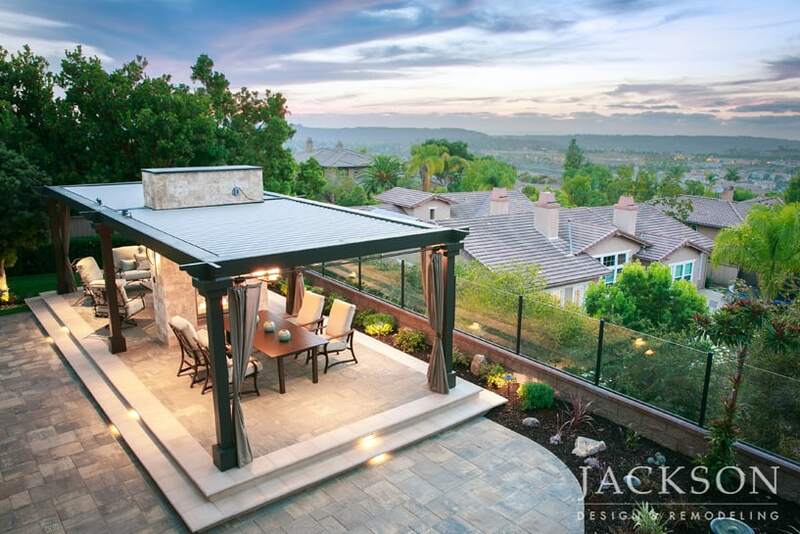 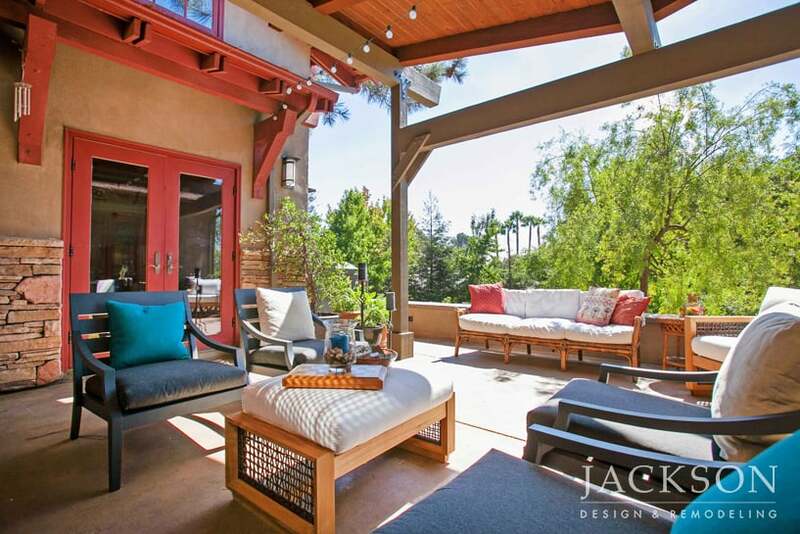 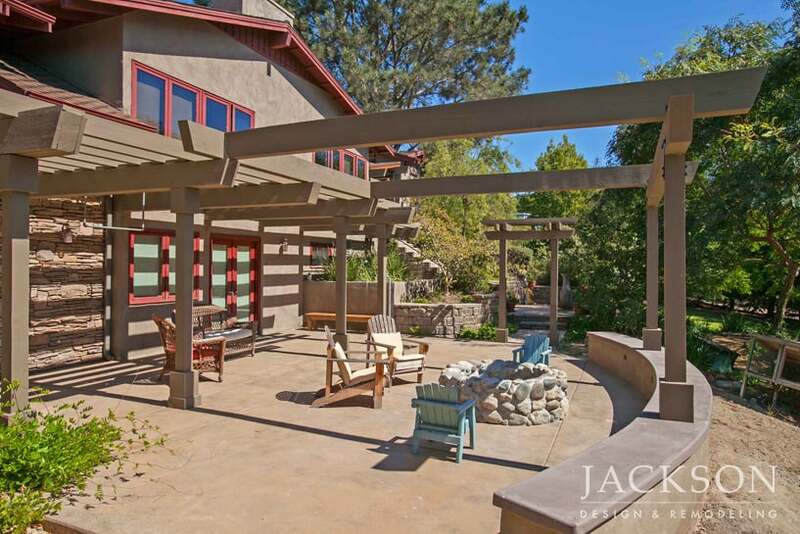 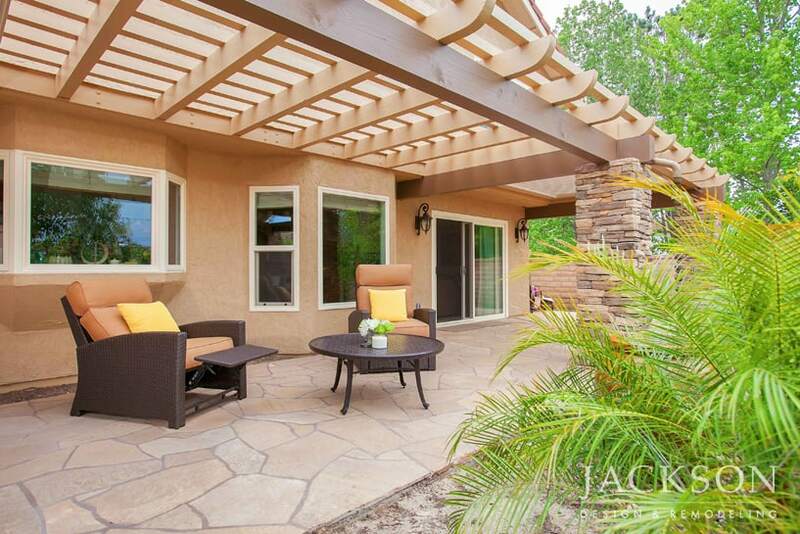 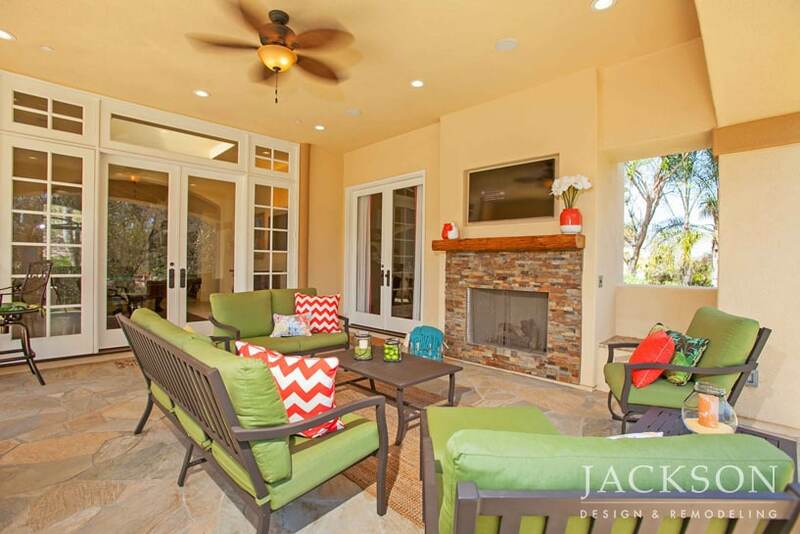 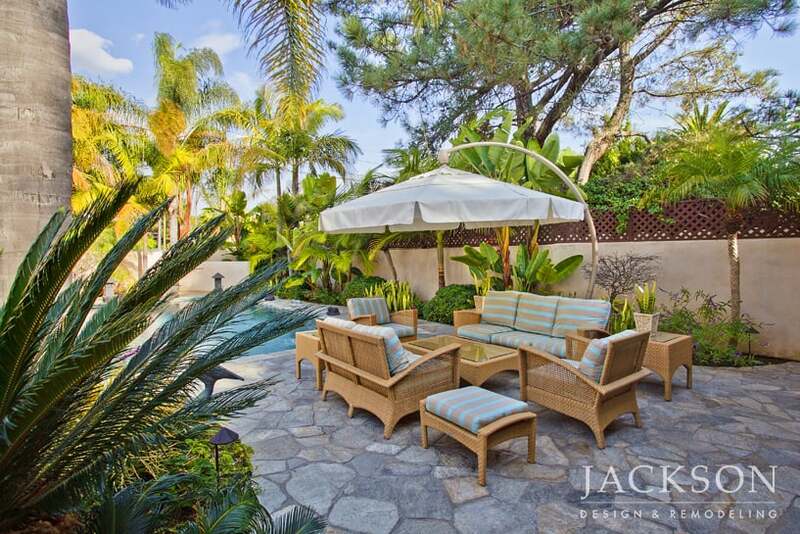 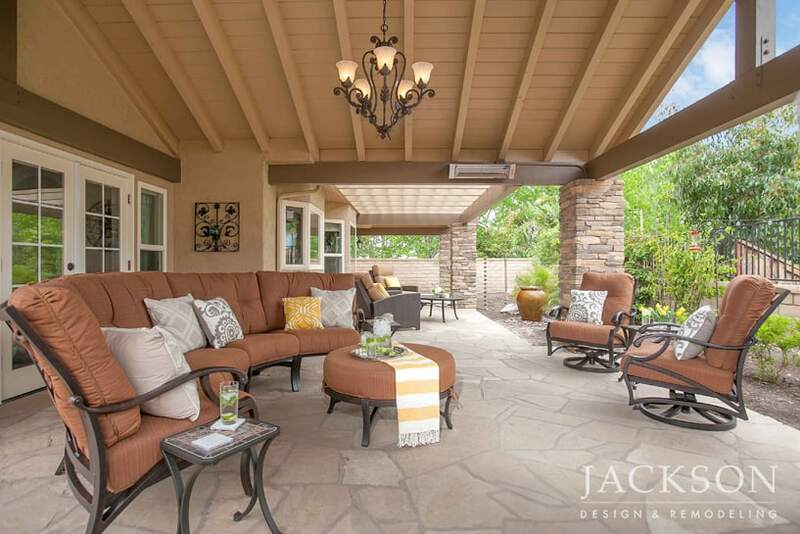 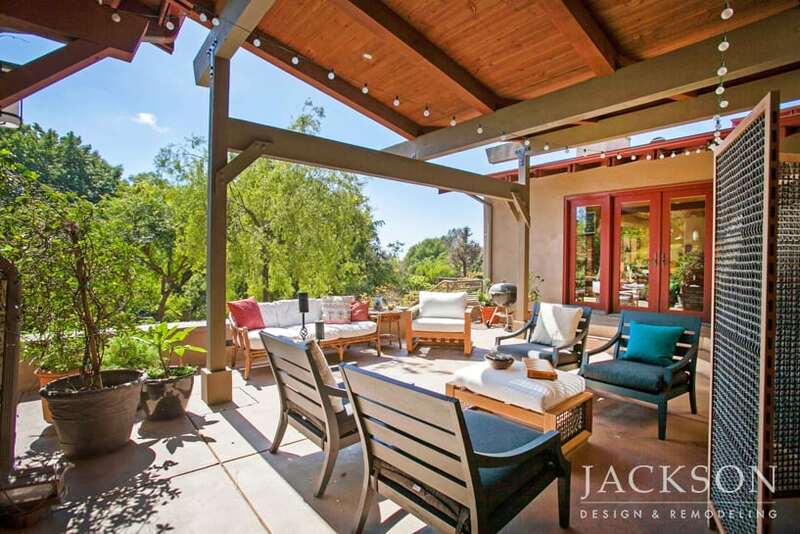 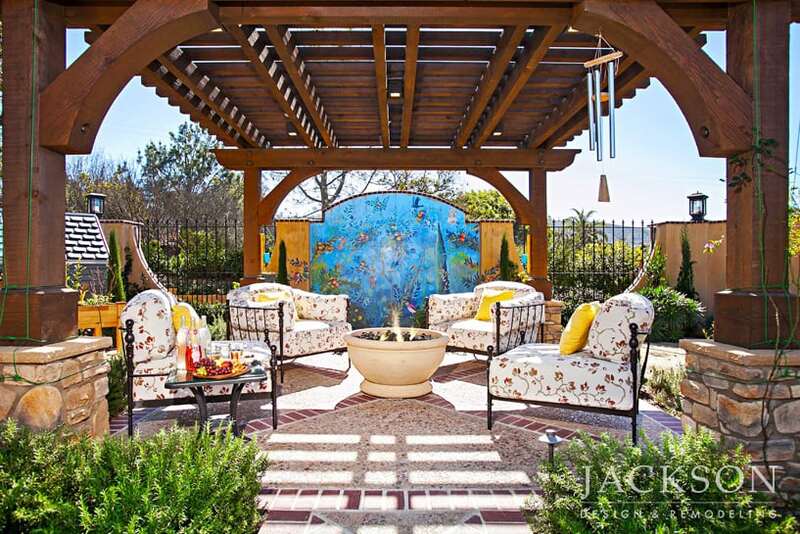 This expansive outdoor living area was designed for family-oriented clients to welcome their kids and grandkids. 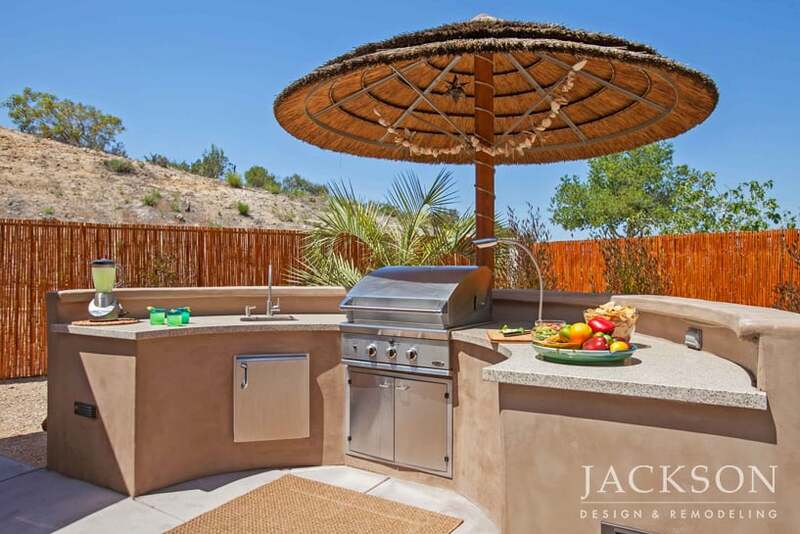 Areas for cooking meals, enjoying drinks and a game at the bar, pool fun or sunbathing are all thoughtfully defined. 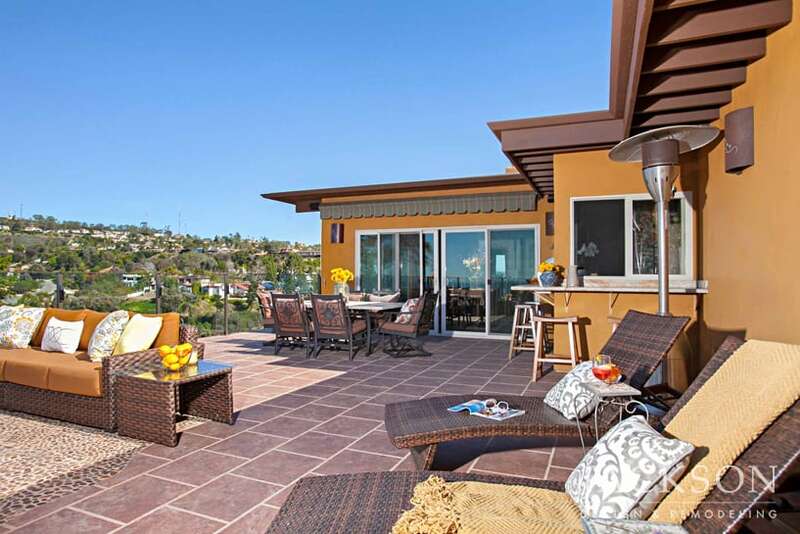 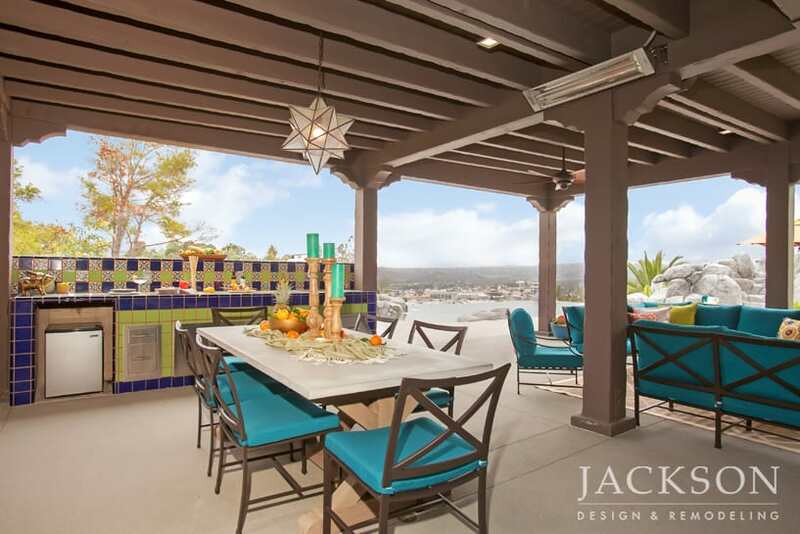 A couple with a hilltop home in La Jolla wanted to transform their outdoor living space using a photo from one of their favorite vacation spots as a guide. 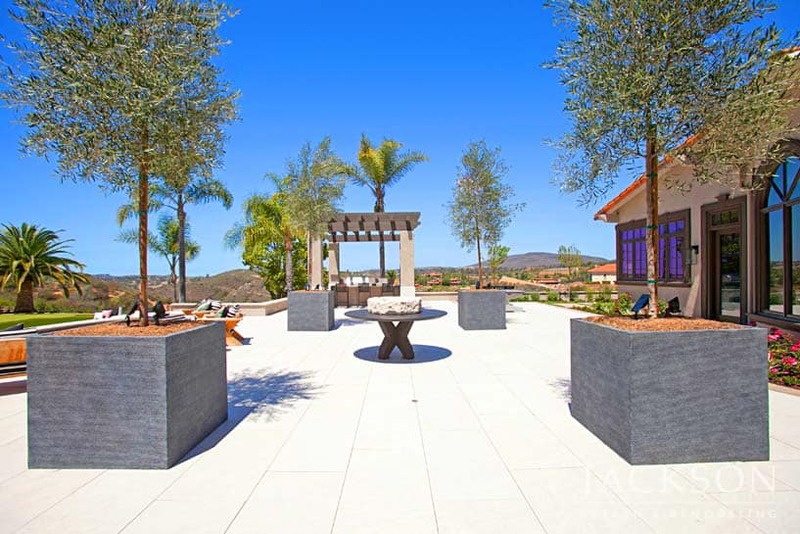 The space now fully embraces its incredible surroundings with awe-inspiring views and welcoming areas for lounging, eating and entertaining with resort-style hospitality. 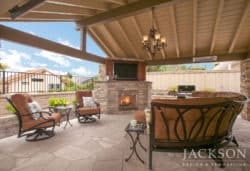 The outdoor area of this rustic cabin-like home for clients who love to entertain features spectacular views of a lush backyard on the upper level and a charming fire pit area on the bottom level. 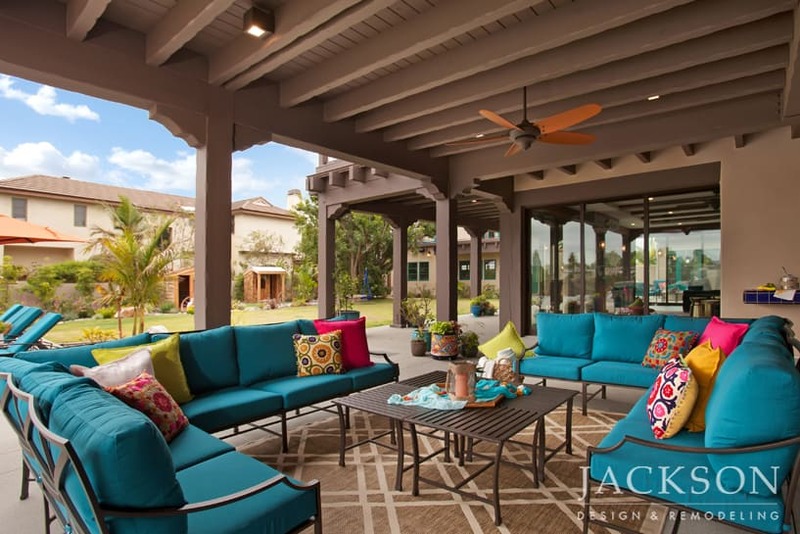 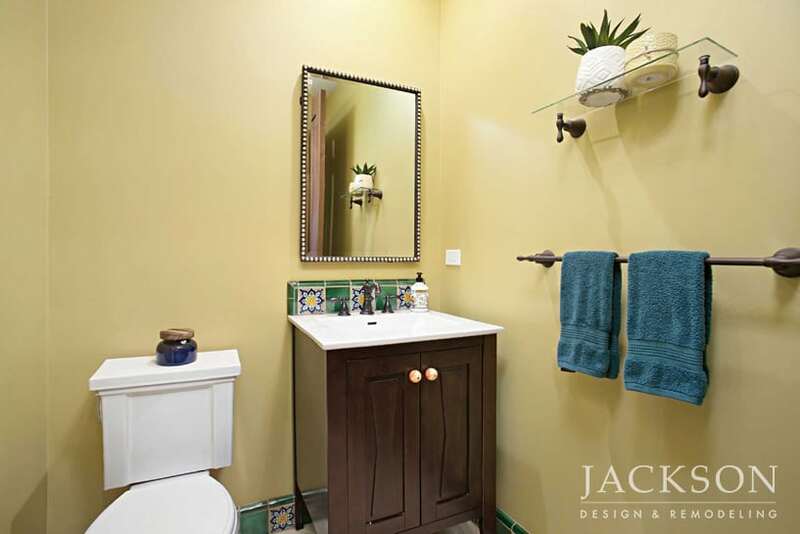 Bringing Mid-Century style to a 100-year old Spanish home, this spacious backyard oasis features several distinct areas for dining, entertaining, and relaxing unified into an inviting outdoor living space. 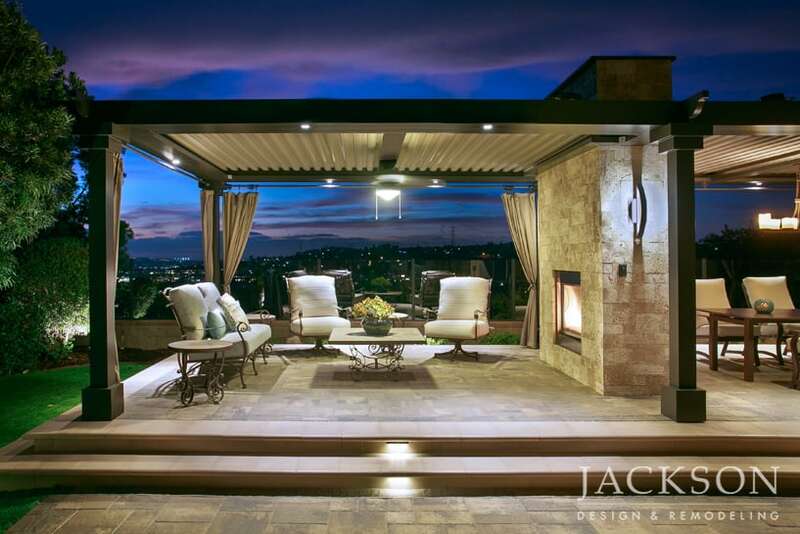 One section was partially elevated to take advantage of impressive views. 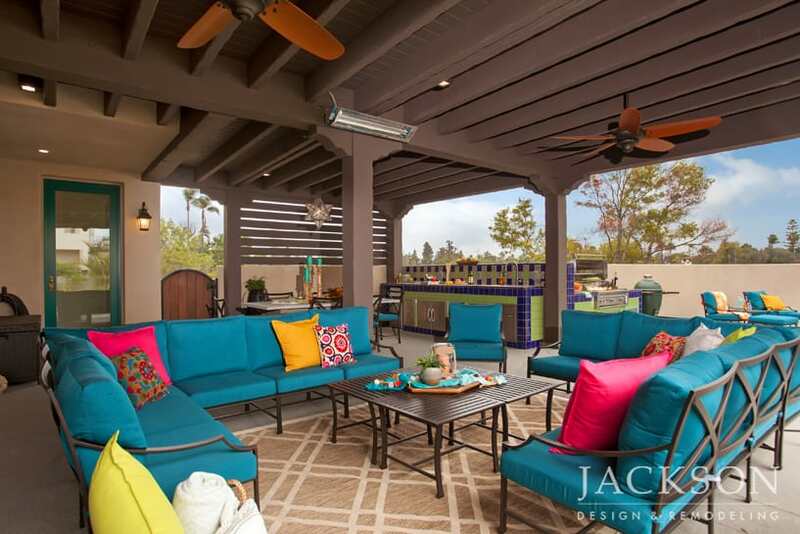 This expansive outdoor space is designed to welcome visitors in comfort and style, no matter the weather or time of day. 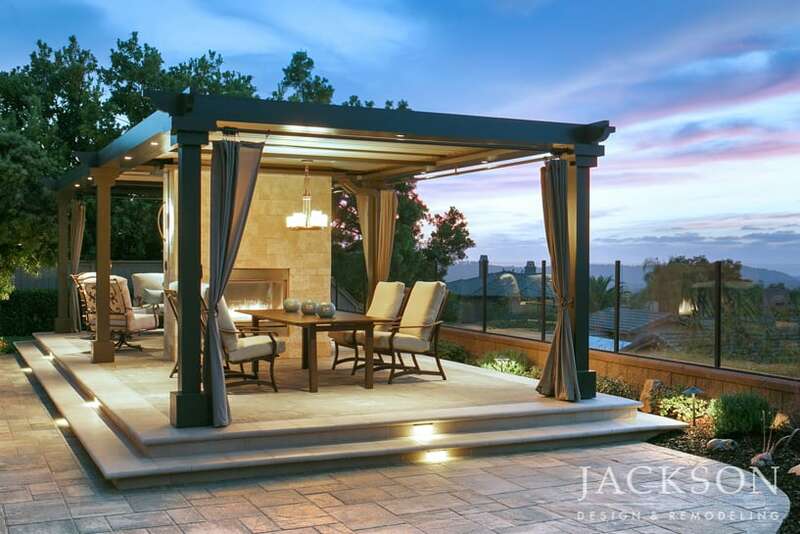 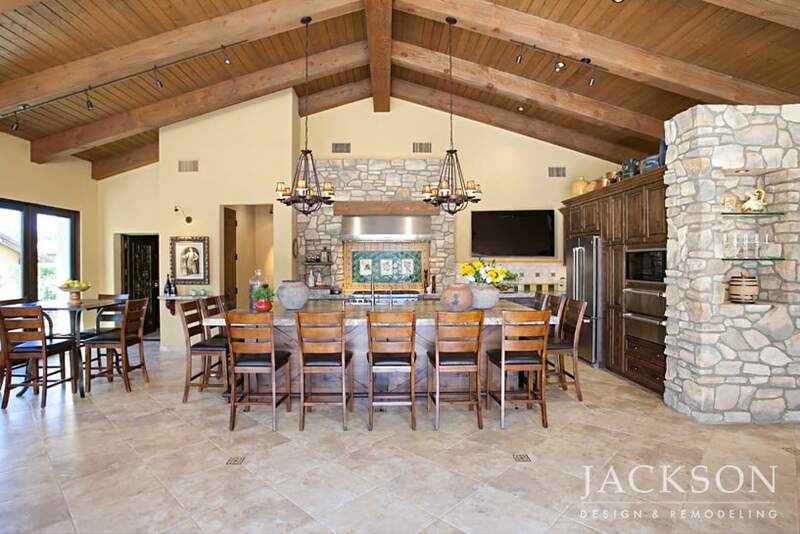 From cozy evening gatherings around the stacked stone fireplace to sunny daytime soirees under a luxury patio cover and custom-built trellises, this space offers appealing options for a couple who loves to entertain. 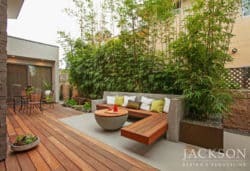 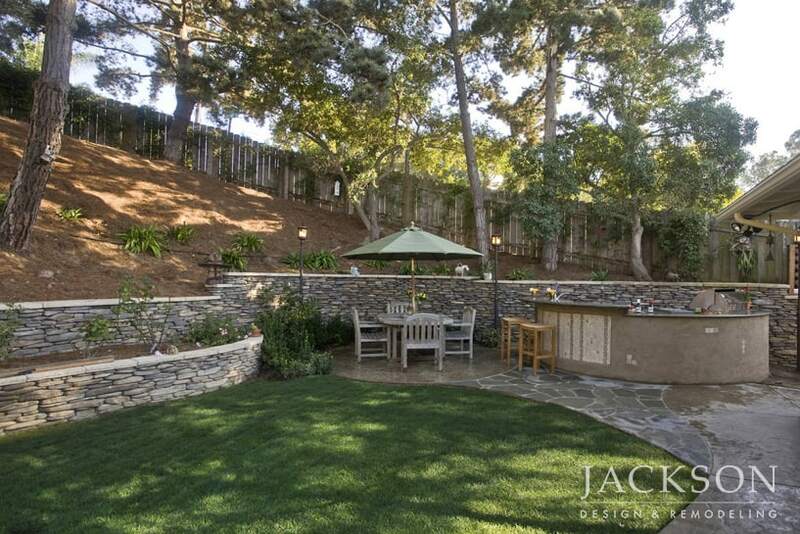 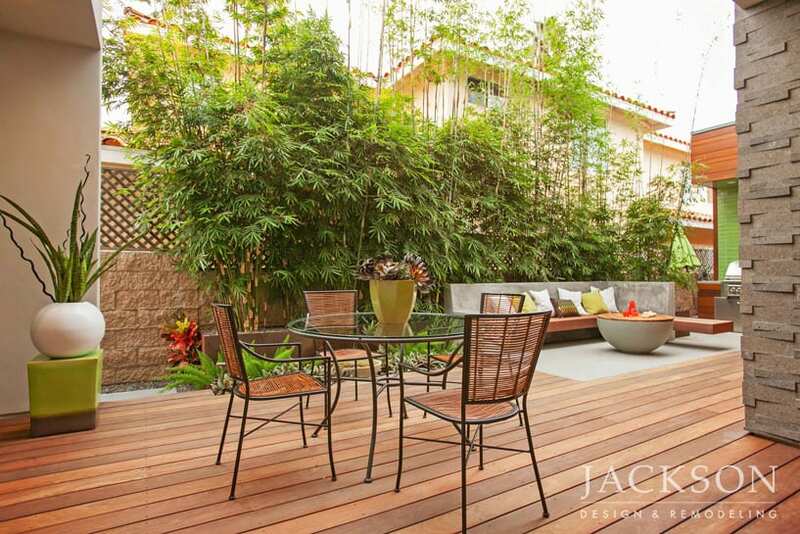 For a sociable client who loves to entertain, this backyard area was designed with an appealing layout and landscaping. 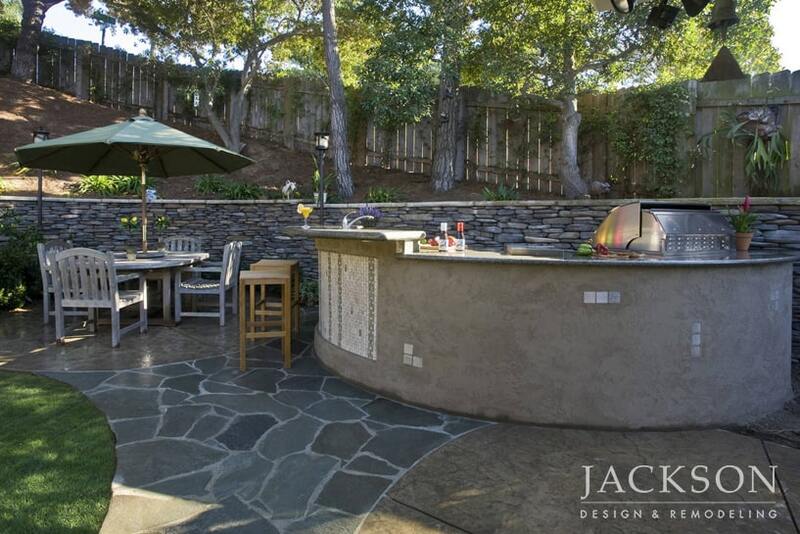 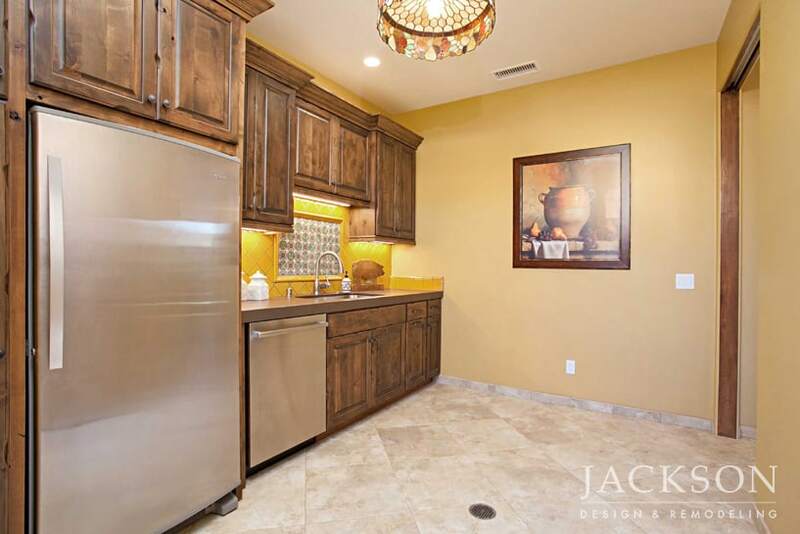 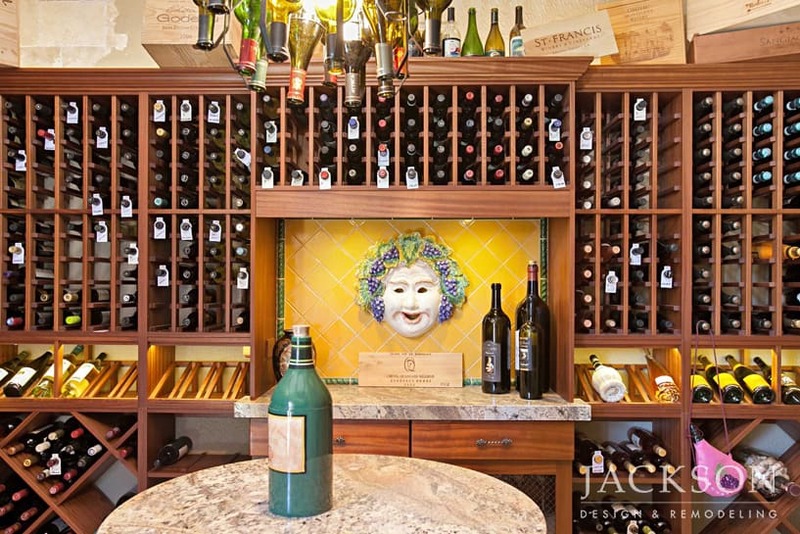 The large curved kitchen and bar are fully equipped and encourage conviviality. 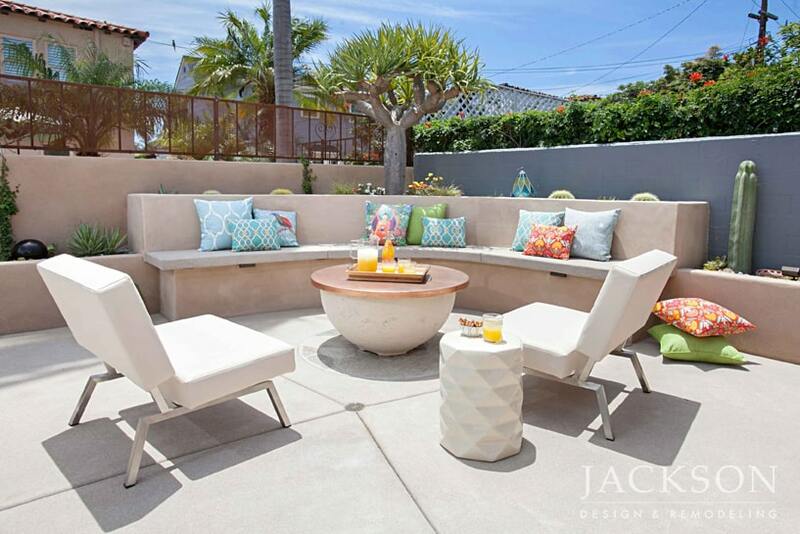 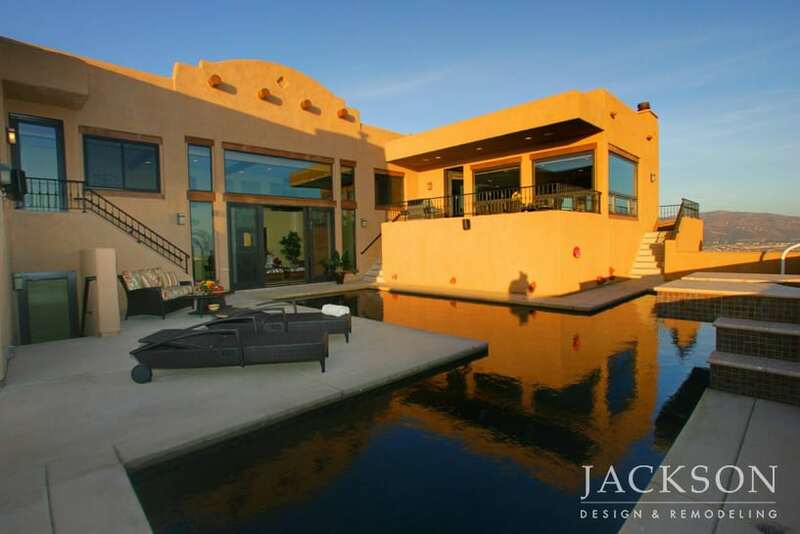 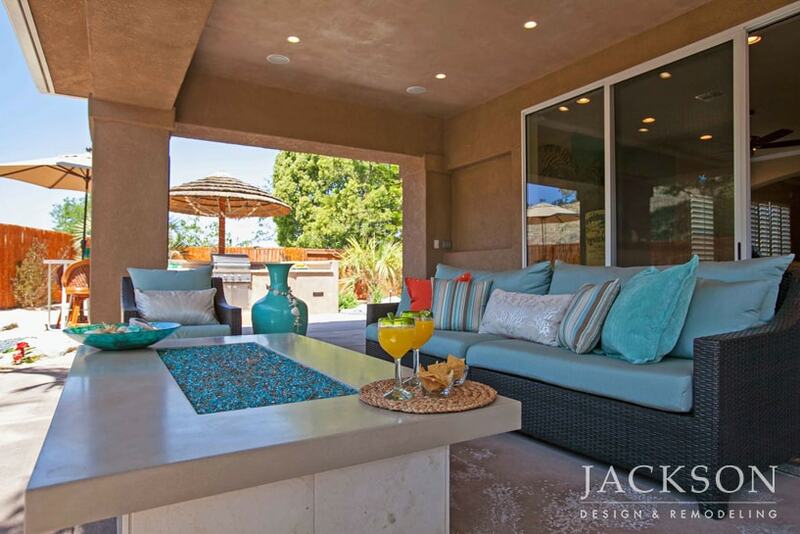 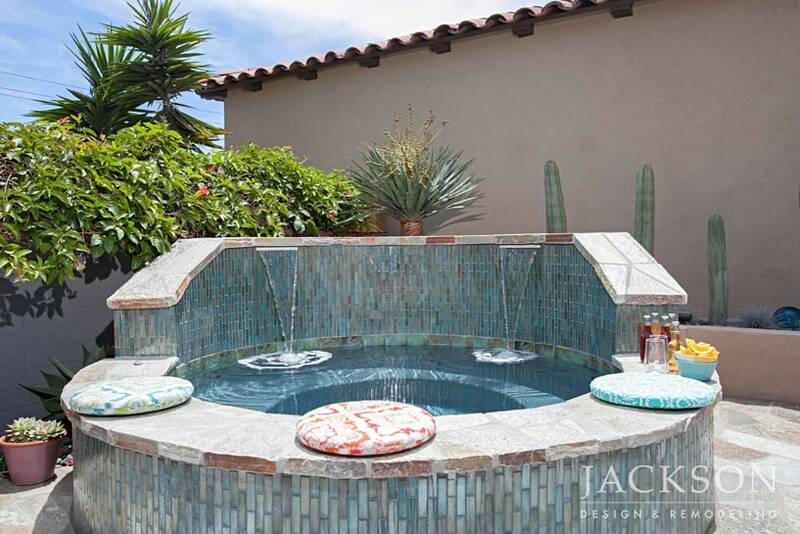 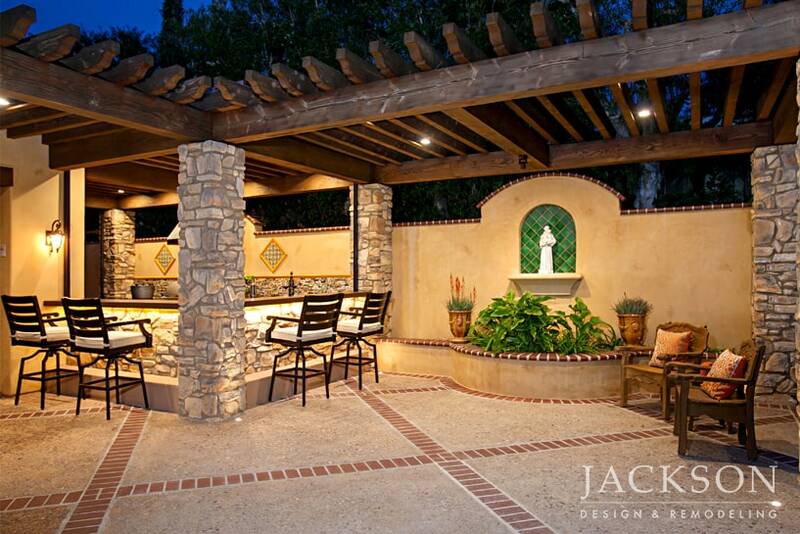 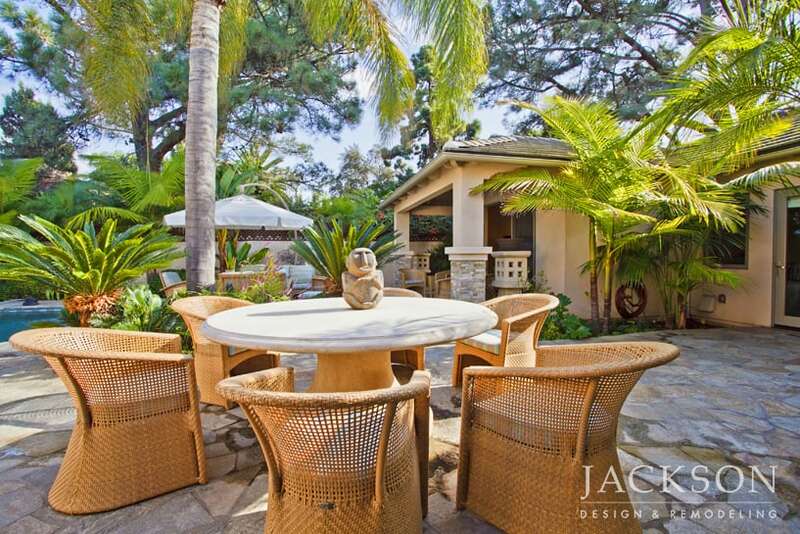 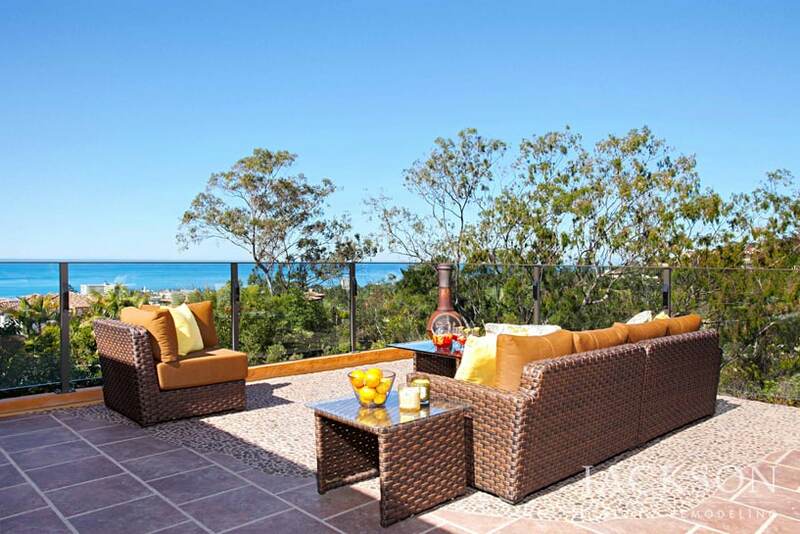 The spirit of this outdoor living area was inspired by the clients vacation home in Mexico. 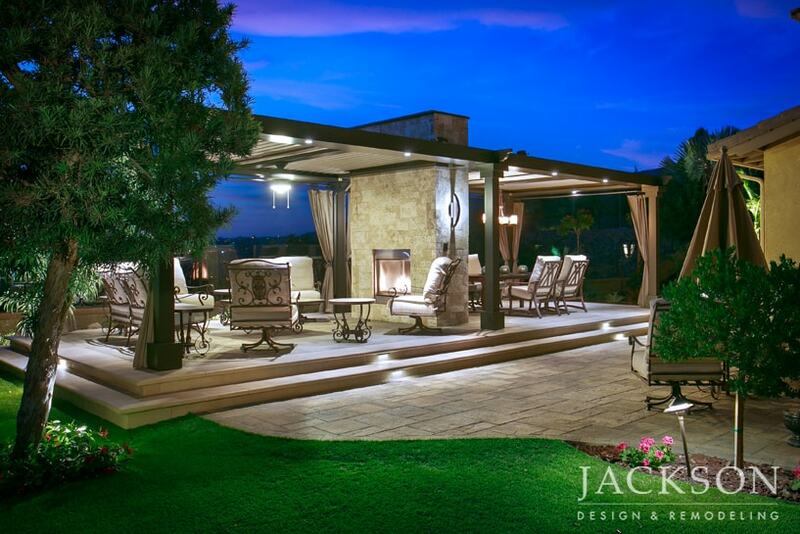 Comfortable seating offers daytime shelter, while lighting and a modern fire pit create a festive nighttime mood. 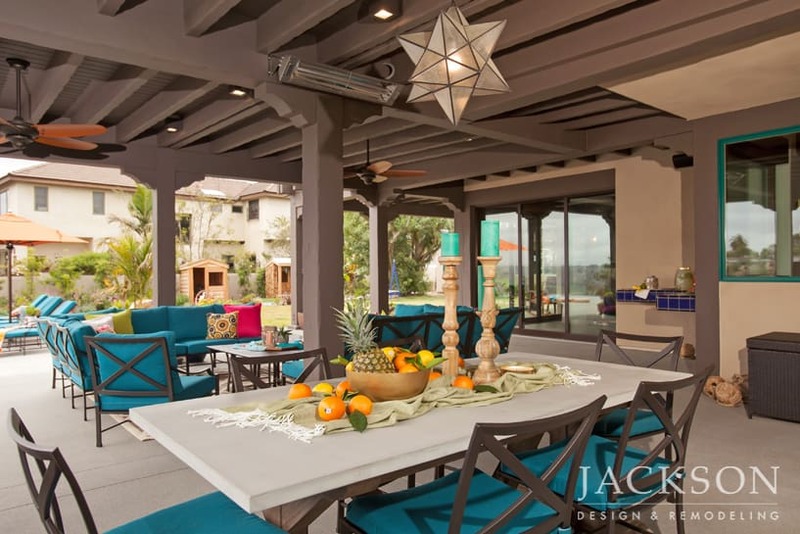 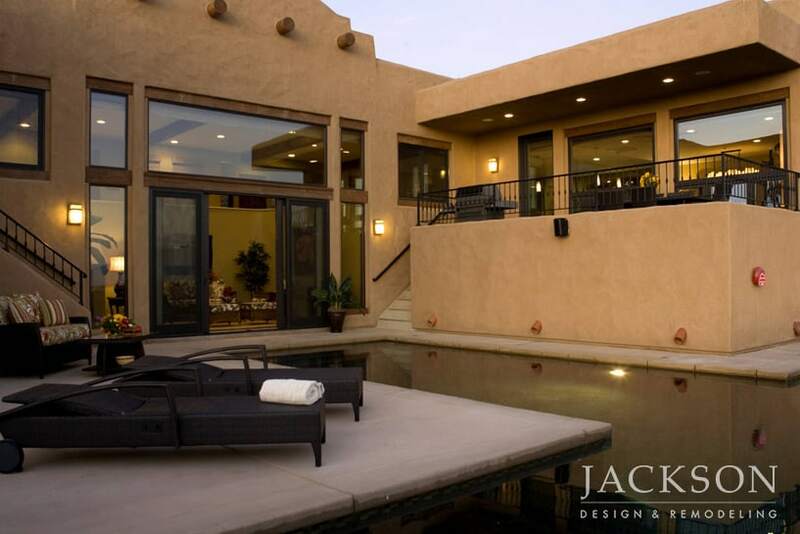 When you’re planning outdoor remodeling for your whole home remodel, professional designers help you balance visual integration with the design details that make your space unique.